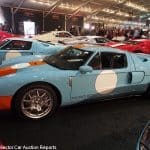 Auctions America is now RM Auctions and the Ft. Lauderdale, Auburn Spring and Fall, Santa Monica and Hershey auctions will now be conducted under this title, differentiated from the RM Sotheby’s auctions in Scottsdale, Paris, London, Monaco, Monterey and the newly announced auction at Techno-Classica in Essen in April 2019. 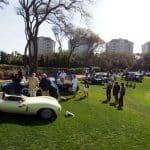 RM Auctions will be conducting the Michael Dingman Collection sale in Hampton, NH 23-24 June (actually I assume it’ll be at the Dingman home in Kensington, NH, but no one knows where Kensington, NH is) while RM Sotheby’s will be holding the Porsche 70th Anniversary auction at the Porsche Experience Center in Atlanta on October 27. Even the venue was different this year at Ft. Lauderdale. The Convention Center had booked one of the four halls for a conflicting event and RM dialed back on the number of consignments, and auction days, to fit within the remaining three halls. They say the sale will be back to full size and three days in 2019. Cutting back by 70-150 cars in the consignment had, as the numbers below indicate, little effect on the total sale. The sell-through was a solid 72.8% and achieving this result with fewer cars meant the average sale was the venue’s highest ever. 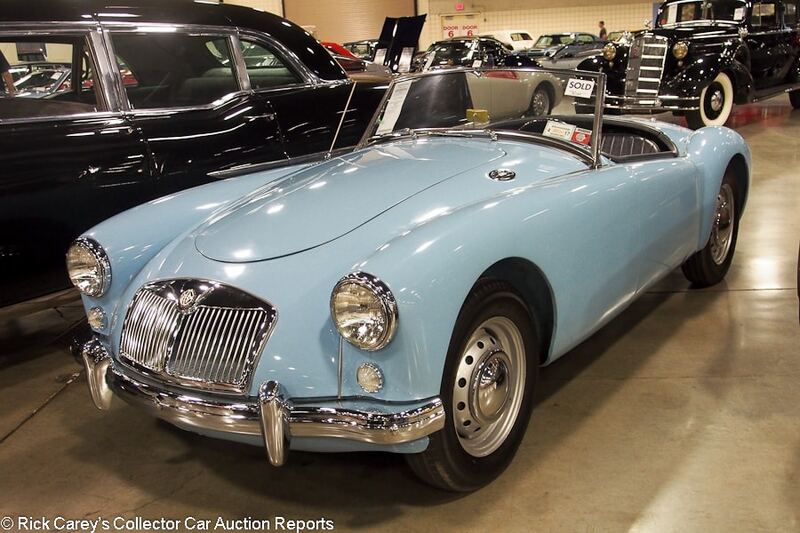 It also meant that most of the cars were better than usually seen at auctions like this. Placing an emphasis on quality over quantity to fit within the smaller space and day less on the block worked, making my job a lot easier finding good vehicles to write up. There was even a good selection of prewar cars, along with the predictable (these days) offerings of late model Porsches and supercars. Worth noting in passing is that 112 of the 337 cars offered had prior auction history in my database. 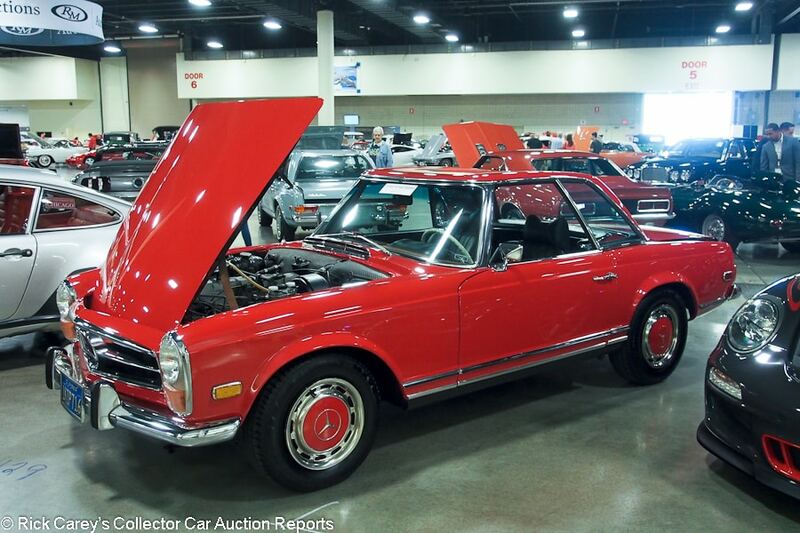 In all but rounding that’s a third of the cars that crossed the block, a sign that getting good auction inventory remains a challenge in the face of more and bigger auctions competing for the same consignments. In other words, it was a very good and highly successful two-days in Ft. Lauderdale where the temperature was in the 80s – in sharp contrast to the dusting of snow in Thompson on Friday. On-site observations and comments are by Rick Carey. The cars that follow are sorted by Marque, Model and Body Style. Full results are at RM’s website (rmsothebys.com has auction listings and results for both RM and RM Sotheby’s) or on the indispensable Hammerprice app. 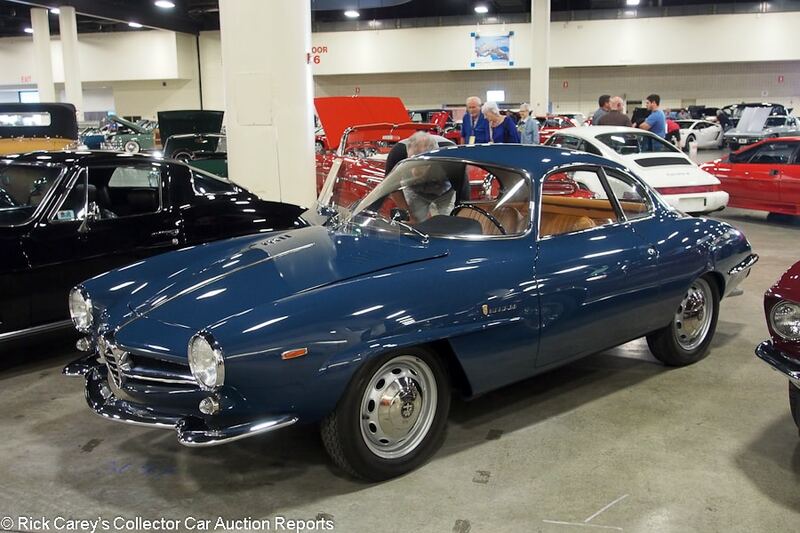 Lot # 3097 1965 Alfa Romeo Giulia Sprint Speciale, Body by Bertone; S/N AR381311; Engine # AR0012401285; Dark Blue/Tan vinyl; Estimate $100,000 – $120,000; Older restoration, 2- condition; With Reserve; Hammered Sold at $88,773 plus commission of 10.00%; Final Price $97,650. – 5-speed, no radio, Italian Webers, velocity stacks, silver steel wheels, Vredestein tires, no radio. – Very good paint, interior and chrome but now with some paint shrinkage and scuffs on the decklid. Wiper scratched windshield. Engine compartment is done right, clean and orderly. Underbody was done, then driven a little. Upholstery is slightly stretched. A good car done thoroughly and to high standards, but showing age. – Offered here last year when it was reported bid to $105,000 without selling. It’s added 13 miles to the odometer since then and does not appear to have been touched, including not getting more than a lick and a promise for the auction. It will reward its new owner for some cosmetic attention and a thorough but routine service and it is a good value at this price. 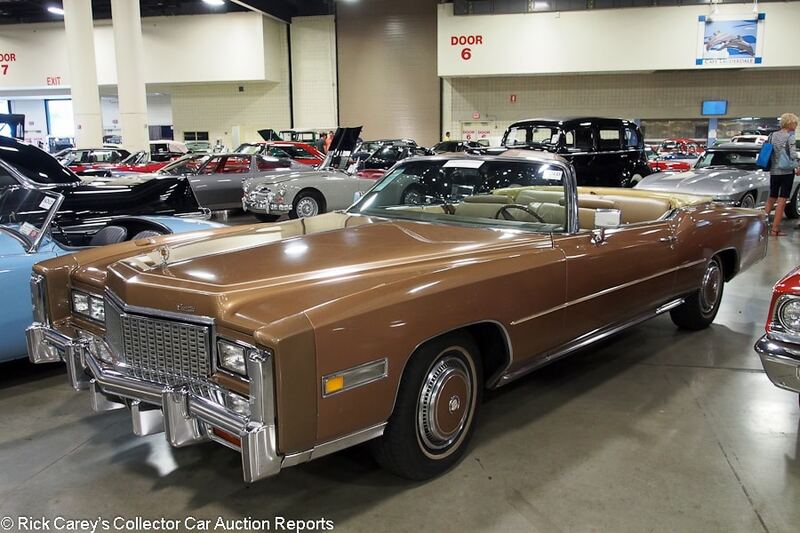 Lot # 1041 1976 Cadillac Eldorado Convertible; S/N 6L67S6Q177321; Gold/Beige leather; Beige vinyl top; Estimate $14,000 – $18,000; Visually maintained, largely original, 3 condition; No Reserve; Hammered Sold at $10,500 plus commission of 10.00%; Final Price $11,550. – Body color wheel covers, Milestar narrow whitewall tires, cassette stereo, Beige parade boot cover. – Sound clearcoat repaint with some orange peel left. Pitted outside mirrors and door handles. Serious paint prep flaws on the boot cover and behind it. Weak rear bumper chrome but good taillights. The driver’s seat is heavily cracked but not torn. The underbody is original. Sound body. – This is a tired Eldorado and it brought a realistic price for its many flaws and superficial old repaint. At the price, though, it is a usable car for weekend cruises, trips to the beach or golf course and parades. 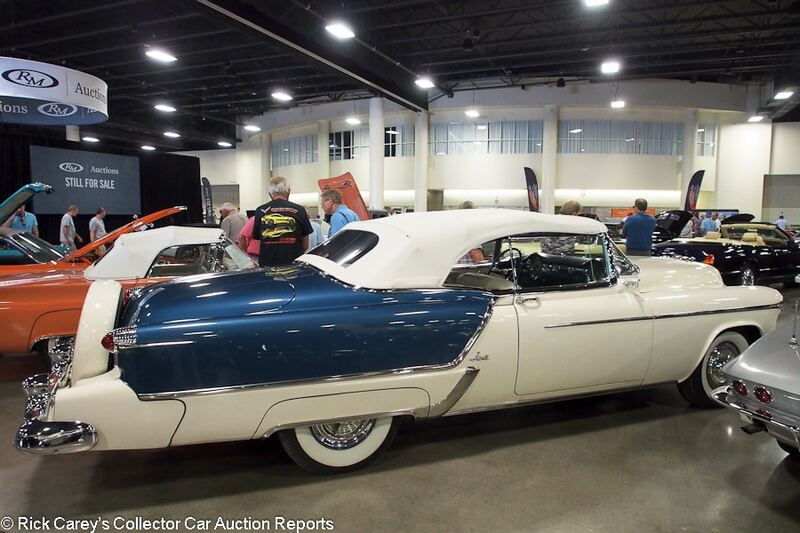 Lot # 3169 1957 Cadillac Eldorado Biarritz Convertible; S/N 5762055425; Dusty Rose/White, Black leather; White vinyl top; Estimate $125,000 – $150,000; Concours restoration, 1- condition; With Reserve; Not sold at Hammer bid of $100,000. – 365/300hp, automatic, power everything, dual quads, batwing air cleaner, silver Sabre wheels, wide whitewalls, parade boot. – Excellent paint, but scratches on the parade boot cover. Bright but scuffed chrome. Paint cracked on the right rear fender. The engine compartment was restored like new but now is a little aged and dirty down where it is hard to reach. Beautiful, but not a show car any more. 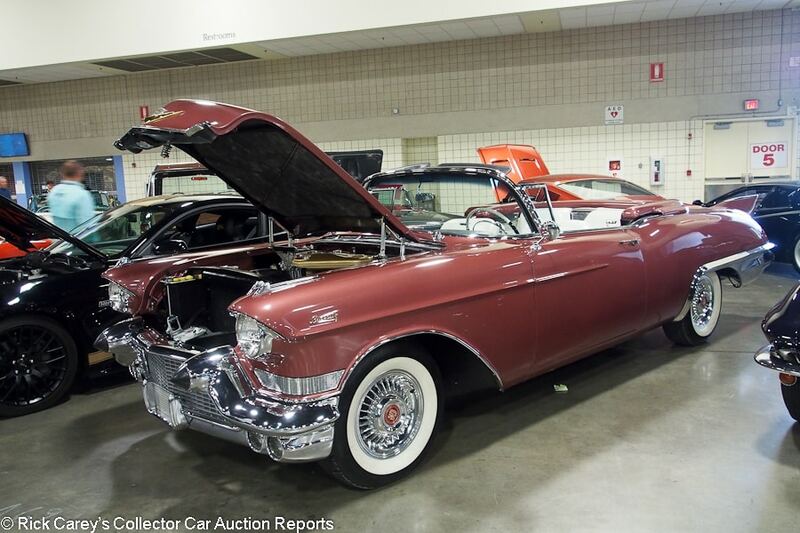 – This Eldorado Biarritz convertible was sold here a year ago for $96,250 all-in, an $87,500 hammer bid, and the consignor is deluded to think it is worth any more than that in a market that is at best static. Turning down the reported high bid, or even the increment before it, was a hasty decision. 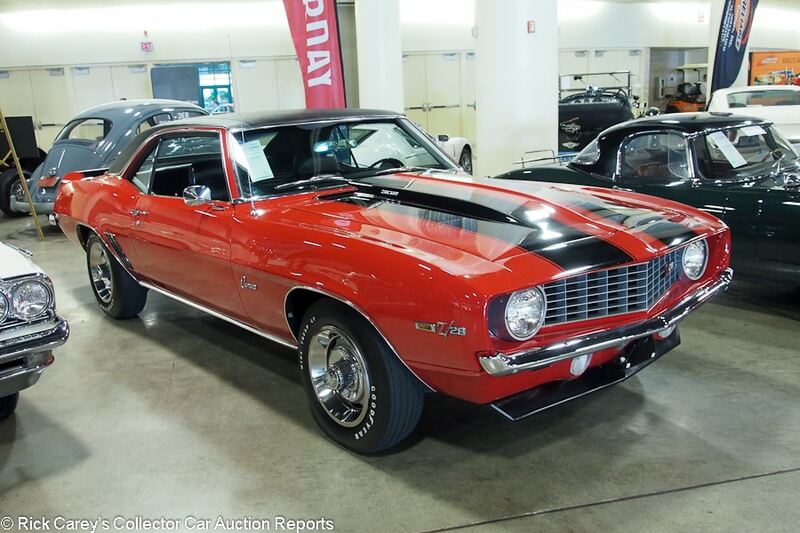 Lot # 3020 1969 Chevrolet Camaro Z/28 2-Dr. Hardtop; S/N 124379N627020; Red, Black vinyl roof and stripes/Black vinyl; Estimate $50,000 – $60,000; Older restoration, 2- condition; With Reserve; Hammered Sold at $57,500 plus commission of 10.00%; Final Price $63,250. – 302/290hp, 4-speed, Hurst shifter, console gauges, Rally wheels with hubcaps and trim rings, Wide Tread GT tires, pushbutton radio, headers, cowl induction hood. – Pitted door handles and outside mirrors, scuffed windshield trim. Seriously flawed decklid and rear spoiler paint. Sound interior. Chassis painted assembled, then driven. Sound, but only a driver. – An competently restored and well-maintained Z/28 driver with a few cosmetic flaws, it is worth every dollar of the price it brought and could have brought a little more without being expensive. 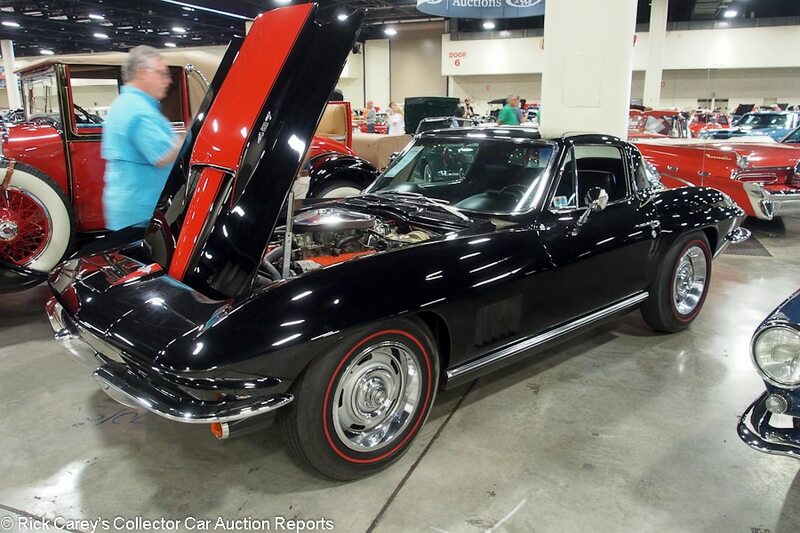 Lot # 3104 1967 Chevrolet Corvette Coupe; S/N 194377S119735; Engine # T0509JG 7119735; Tuxedo Black, Red stinger/Black vinyl; Estimate $150,000 – $200,000; Older restoration, 3+ condition; With Reserve; Hammered Sold at $150,000 plus commission of 10.00%; Final Price $165,000. – 427/400hp, 4-speed, power brakes and steering, air conditioning, AM-FM, power windows, woodgrain steering wheel, Rally wheels with hubcaps, trim rings and red line tires. – NCRS Top Flight (5 times) and Performance Verification awards. Sound old paint, chrome and interior. Orderly but dirty engine compartment. Restored like new years ago, successfully shown, then driven. Needs plenty but is far from needing another restoration. The engine suffix, JG, indicates it was a Powerglide car when built. – Sold at Mecum’s Kissimmee auction in 2013 for $164,300, then at the same sale three years later in 2016 for $140,250, the result here is exceptional for its condition and for the indicated change from Powerglide to a 4-speed. A result more in line with what it brought at Kissimmee in 2016 would have been more realistic. 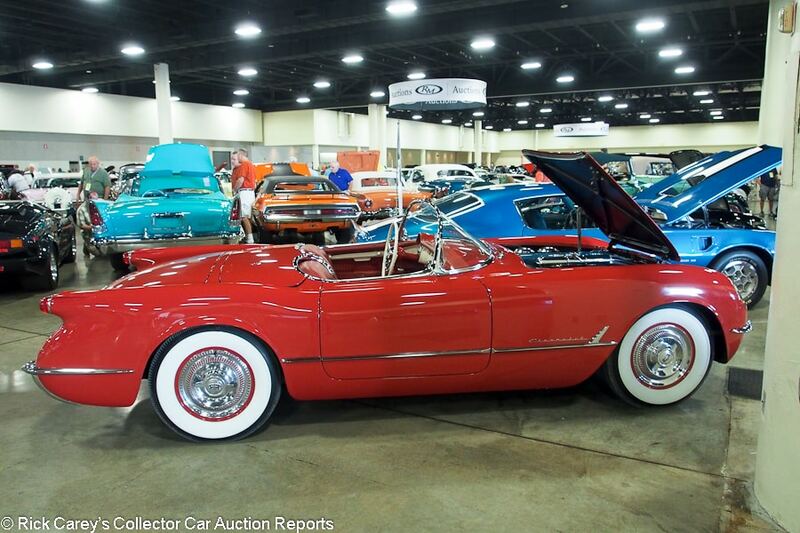 Lot # 3145 1954 Chevrolet Corvette Roadster; S/N Engine No. 0080525F54YG; Sportsman Red/Red vinyl; Beige cloth top; Estimate $75,000 – $85,000; Recent restoration, 2+ condition; With Reserve; Hammered Sold at $68,000 plus commission of 10.00%; Final Price $74,800. – 235/155hp, Powerglide, WonderBar radio, spinner wheel covers, bias ply wide whitewall tires. – Excellent fresh paint, chrome, interior and top. The engine compartment is like new. – This Corvette is a very good value at this price, a value that becomes even better in its unusual color (only 100 are believed to have left Flint in Sportsman Red). It is troubling, though, that the VIN is the engine number, and that there is no NCRS or Bloomington Gold judging history. The result here fully accounts for the lack of judging history. Lot # 3101 1967 Chevrolet Corvette 427/435 Roadster; S/N 194677S115522; Engine # T0310JE 7115523; Sunfire Yellow, Black stinger/Black vinyl; Black vinyl top; Estimate $125,000 – $150,000; Older restoration, 2 condition; With Reserve; Hammered Sold at $102,273 plus commission of 10.00%; Final Price $112,500. – 427/435hp, 4-speed, AM-FM, side exhausts, finned alloy wheels, Michelin X red line tires. – Very good paint, interior, top and chrome except for an annoying dent on the right windshield post. This is about as good as it gets, sympathetically restored to like new condition without going overboard. The only reservation is that it isn’t represented with any judging information, unusual for such a carefully restored Corvette. 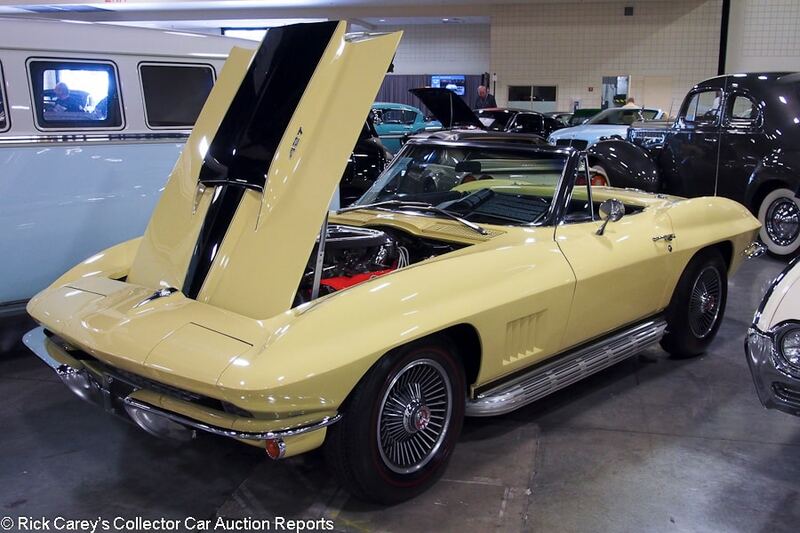 – Sold here a year ago for $100,100, this post-block sale result is still representative for a quality restored Corvette with a highly-prized drivetrain in attractive colors. 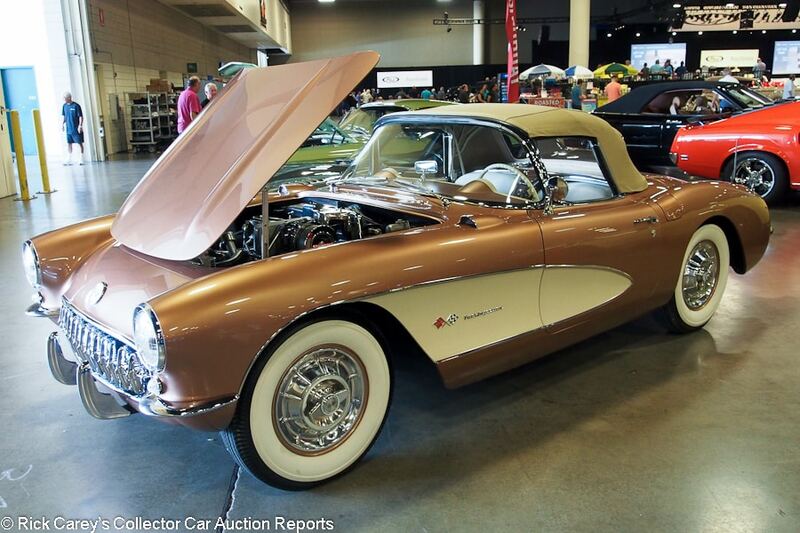 Lot # 3170 1957 Chevrolet Corvette FI Convertible; S/N E57S105940; Engine # F014EL; Gold, Beige coves/Beige vinyl; Beige vinyl top; Estimate $100,000 – $150,000; Older restoration, 2- condition; With Reserve; Hammered Sold at $97,500 plus commission of 10.00%; Final Price $107,250. – 283/283hp fuel injection, 4-speed, WonderBar radio, spinner wheel covers, bias ply Firestone wide whitewalls. – Restored to better than new with excellent paint, chrome, glass and top. There is some paint loss under the hood. No judging information. – Sold at Mecum Monterey in 2014 for $124,200, the result here is appropriate in the more measured market of the past four years. Gold is an unusual color for a ’57 Corvette and the available Sierra Gold is darker than this hue but no matter the details it will stand out in any Corvette lineup. 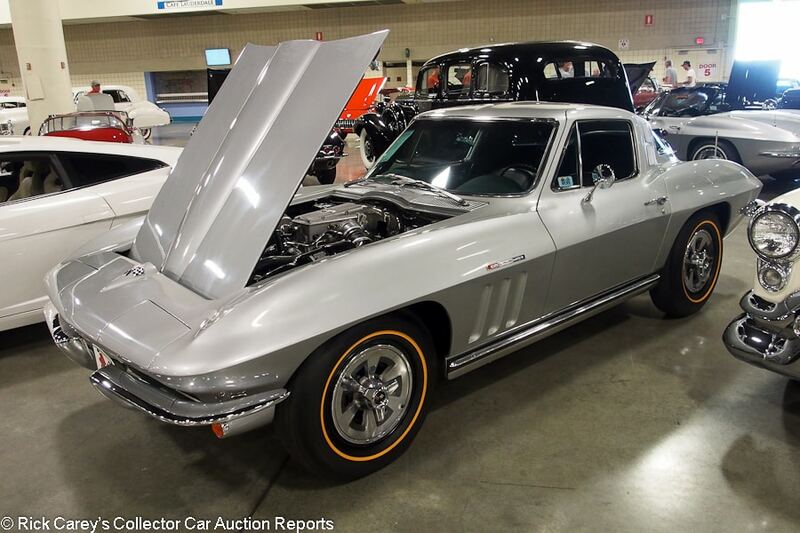 Lot # 3133 1965 Chevrolet Corvette FI Coupe; S/N 194375S108221; Engine # 5108221 F0119HG; Silver Pearl/Blue vinyl; Estimate $120,000 – $140,000; Recent restoration, 2 condition; With Reserve; Not sold at Hammer bid of $80,000. – 327/375hp fuel injection, 4-speed, heater, AM-FM, spinner wheel covers, gold line bias ply tires. – Very good clearcoat paint. Chrome, bright trim and interior are like new. The engine compartment and chassis are freshly restored and cleaner than it came off the truck from St. Louis in 1965. – There is nothing about this FI Corvette that gives a clue about why it was ignored by the Ft. Lauderdale bidders and it should have brought over $100K. There were, however, many mid-year Corvettes in this auction and it may have been overlooked by buyers who preferred split-windows. By passing on this car they missed an opportunity. 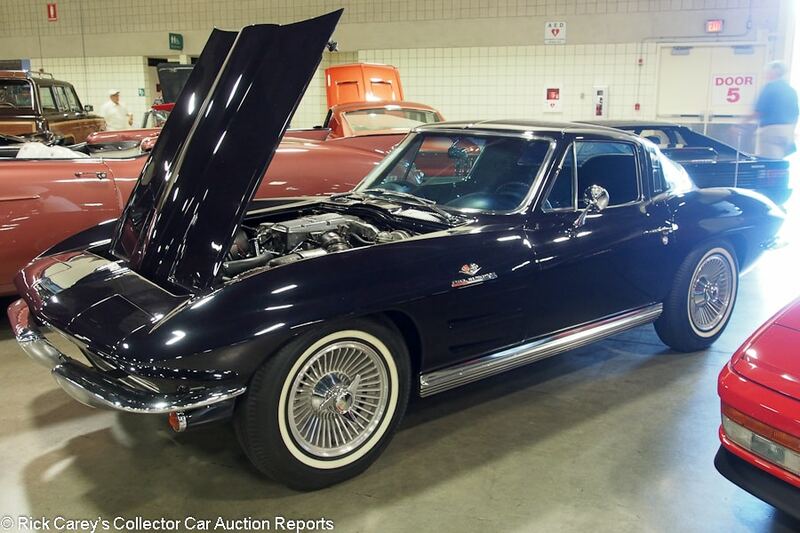 Lot # 3171 1964 Chevrolet Corvette FI Coupe; S/N 40837S105311; Engine # 4105311 F1106RF; Purple Metallic/Black vinyl; Estimate $80,000 – $100,000; Visually maintained, largely original, 3 condition; With Reserve; Not sold at Hammer bid of $65,000. – 327/375hp, 4-speed, power brakes, AM-FM, heater, spinner wheel covers, Michelin blackwall tires. – Clean, orderly and original engine compartment and chassis. Fair old repaint with some stress cracks. Sound original interior. A sound and usable Corvette with a correctly stamped engine block. The car card made no representations about the driveline’s originality to this car, however. – A decent car looking for a good home: Sold here in 2013 for $60,500, then at Mecum Kissimmee in 2016 for $71,500, it’s been following the market’s slide since then. Bid to $80,000 at Mecum Houston in 2016 and Kissimmee in 2017, $75,000 at Kissimmee this January. The metallic Purple paint job isn’t doing it any favors, though, and the owner is faced with a decision: repaint it (in the original color, please) or accept the bidders’ judgment and let it go for a price that discounts the cost of the repaint. Lot # 1142 1963 Daimler SP 250 Dart Convertible; S/N 104178; BRGreen, BRGreen hardtop/Biscuit; Biscuit top; Estimate $65,000 – $85,000; Cosmetic restoration, 2- condition; With Reserve; Not sold at Hammer bid of $50,000. – RHD. 2548/142hp V-8, 4-speed, two tops, Panasport wheels, rollbar, woodrim steering wheel. – Sound repaint with some microblisters on the hood and fisheyes. Cracked left front fender flare. Very good recent interior and chrome. Clean, shiny engine compartment that has been given some glossy paint that doesn’t extend to the chassis. Highly polished aluminum on the engine. A rare car in the U.S. with a tall, odd-looking hardtop that has one good effect: it distracts onlookers’ eyes from the otherwise bizarre Daimler Dart bodywork. – A comprehensively restored and pristine SP250 might be worth the reported high bid, but this SP250 is neither of those things and the reported high bid here should have seen it off and away to a new owner. The attention paid to the underhood aluminum and the hat-clearance hardtop don’t make this a show car. Lot # 1040 1959 Devin-MG Ford Roadster; S/N GHN5UF376135G; Metallic Blue, White stripe/Black leatherette; Estimate $30,000 – $40,000; Rebodied or re-created, 3- condition; No Reserve; Hammered Sold at $18,000 plus commission of 10.00%; Final Price $19,800. – Devin body, MGA frame, 302 Ford V8, T5 5-speed, Edelbrock 4-barrel, driver’s rollbar, side exhausts, Hurst shifter, chrome wire wheels, front disc, rear drum brakes, Auster windshield, windwing, woodrim steering wheel, hood scoop. – Poor, scratched, swirled paint, uncomfortable seats with loose driver’s cushion. Weak chrome. Orderly painted chassis. Rough. A homebuilt that looks like a homebuilt with a superbly ugly hood scoop. – Bill Devin’s fiberglass bodies were the class of the field in the Fifties and Sixties, professionally laid-up and gorgeously proportioned. They were adaptable to all kinds of chassis of the day and, as in this case, got all kinds of drivetrains. Having said that, a 302 Ford with a 4-barrel seriously challenges the structural rigidity of an MG A, let alone its rear axle and rear drum brakes. This one has had little attention and even less preparation for the auction, neglect seemingly calculated to make it unattractive. Having made that observation, this is MG A money and this is a far more unusual and beautiful car that has potential to be much more attractive (and valuable) in the hands of someone with a modicum of esthetics. 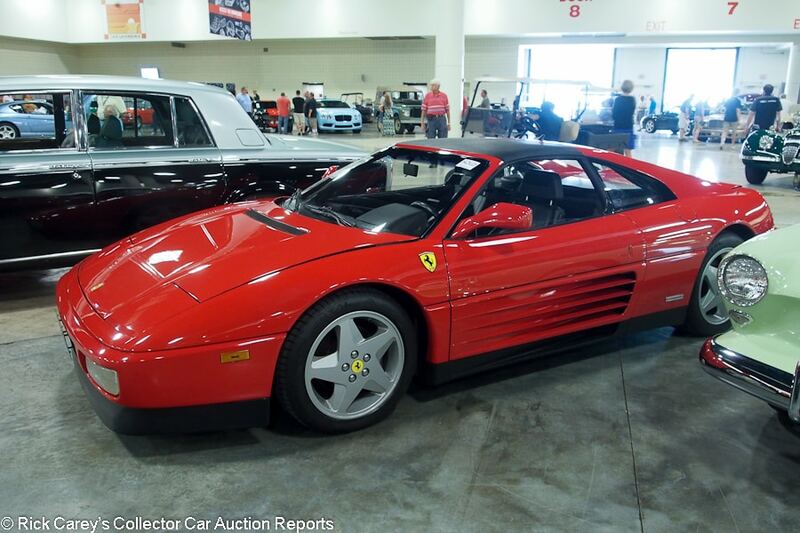 Lot # 1075 1990 Ferrari 348ts Spider; S/N ZFFFG36A6L0087111; Red, Black vinyl roof panel/Black leather; Estimate $45,000 – $55,000; Unrestored original, 3 condition; With Reserve; Hammered Sold at $45,500 plus commission of 10.00%; Final Price $50,050. – Tool kit, owner’s manual, tilt steering column, power windows and mirrors, stability control, CD stereo. Assembly # 03839. – Showing 13,888 miles. Good paint with some scuff and swirl marks and water spots. Rubber trim is good. Engine bay has a film of dirt and could do with a good detail. Underside shows basic signs of outdoor use. Interior shows wear corresponding with the mileage. Paint chipping off the windshield vent covers. Long crack on the rear window. Road grimy original undercoat. Driver’s seat cushion seams are starting to pull. 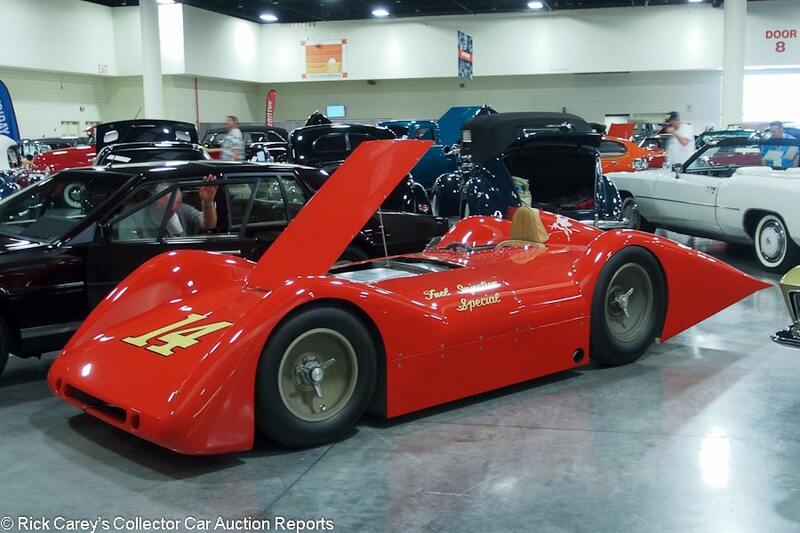 – Sold at Mecum’s Indy auction in 2017 for $59,400, then at Kissimmee three months ago for $48,400. The odometer has added 73 miles since 2017. The car is decent and this is what it’s worth, give or take a few thousand dollars over the past year. 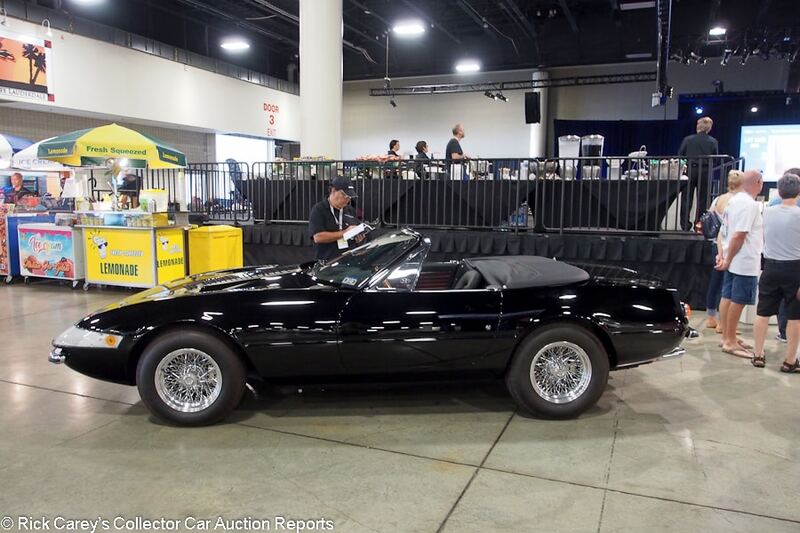 Lot # 3153 1969 Ferrari 365 GTB/4 Daytona Spyder Conversion; S/N 12891; Black/Black leather, Red bars; Black top; Estimate $750,000 – $850,000; Recent restoration, 2 condition; With Reserve; Not sold at Hammer bid of $675,000. – Plexi nose panel, chrome spoke Borrani wire wheels, Michelin XWX tires, Becker Mexico cassette, Veglia air conditioning, power windows. – Very good recent paint and interior, excellent dashtop. Engine compartment and chassis are like new. Restored like it was a Scaglietti Spyder. – Done to high standards but the only way to find out where or by whom this Daytona was converted was to happen across the listing on RM Sotheby’s website, disguising a significant issue among Daytona Spyder conversions. 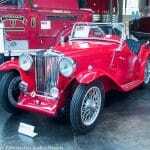 [It was Mike Sheehan’s European Auto, one of the best in the field.] This is a realistic offer under the circumstances, but the seller was also realistic in not accepting it. Maybe a trip to RM Sotheby’s Monterey auction where a catalog could better explain its details would do the trick. 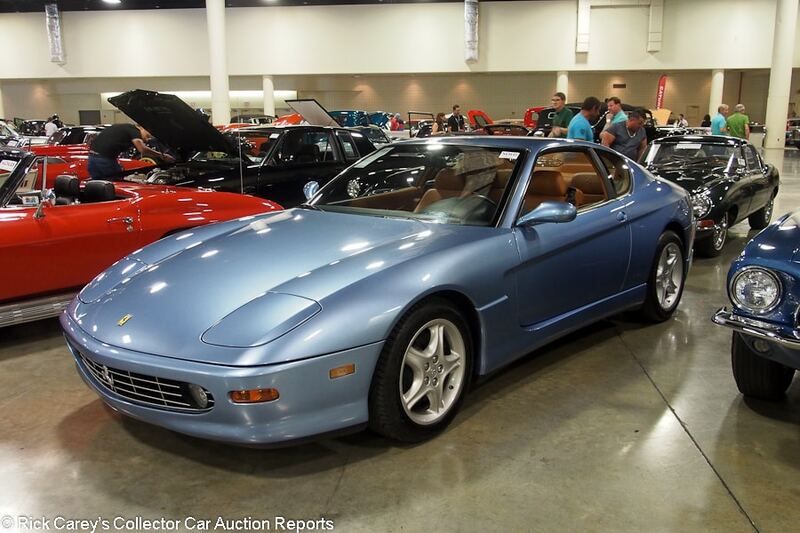 Lot # 3056 2000 Ferrari 456M GT Coupe; S/N ZFFWP44A5Y0119224; Azzurro California/Saddle leather; Estimate $120,000 – $140,000; Unrestored original, 2- condition; With Reserve; Hammered Sold at $115,000 plus commission of 10.00%; Final Price $126,500. – 6-speed, air conditioning, factory stereo, factory alloy wheels, Michelin Pilot Sport tires, black calipers. – Barely creased driver’s seat upholstery and a few small paint blemishes on the hood are all that separate this Ferrari from the showroom. The chassis and underbody are dirty but not grimy and the 13,379 miles on the odometer are represented as all it has covered in the last 17 years. Said to have a recent service and new clutch. – 13,379 miles and it needs a new clutch? Who was driving this thing? It’s a challenge many of these recent Ferraris (and Porsches, and Corvettes) face: drivers who want the latest thing but don’t know how to drive them without elaborate mechanical and electronic aids. No matter, it’s been fixed (although how recent ‘recently’ isn’t specified) and this is a representative price for a 6-speed 456M GT. 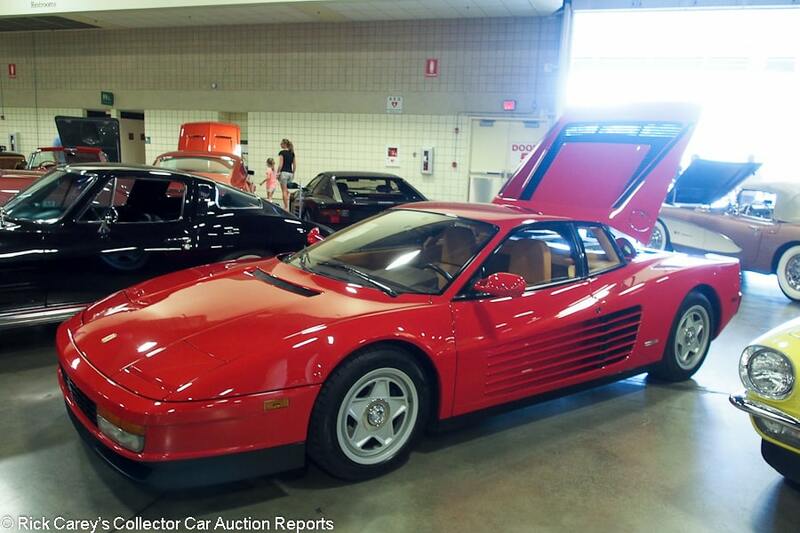 Lot # 3132 1987 Ferrari Testarossa Berlinetta; S/N ZFFSG17A4H0070221; Red/Tan leather; Estimate $90,000 – $120,000; Unrestored original, 3 condition; No Reserve; Hammered Sold at $80,000 plus commission of 10.00%; Final Price $88,000. – Air conditioning. – Mediocre old repaint with stone chips. The underbody is original, as is the casually cleaned up engine compartment. The chassis is similar. One owner since 1987, 34,360 miles, but not a cherished possession. – This is a comprehensively disappointing Testarossa that the seller didn’t care enough about even to have it cleaned up for the auction. That’s not a reassuring presentation, particularly for a car that needs regular, expensive, attention. There were three Testarossas in the auction, giving buyers plenty of choice. This was the least expensive of the three for good reason. 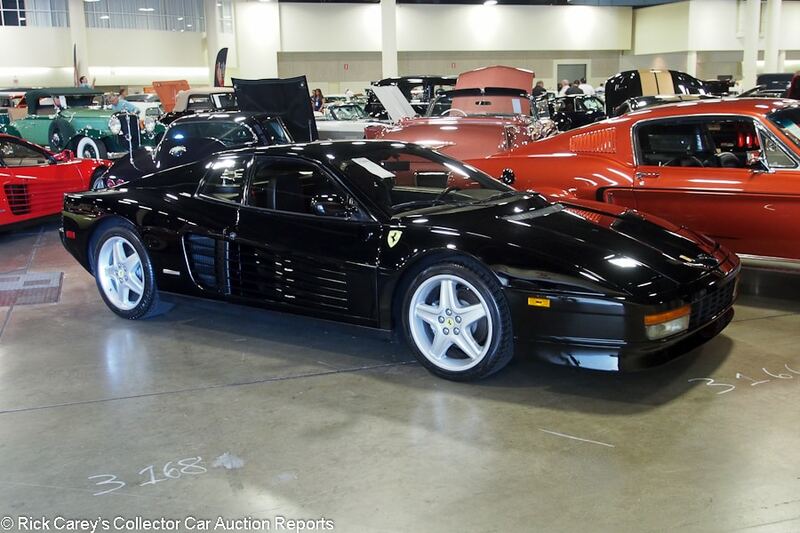 Lot # 3166 1988 Ferrari Testarossa Berlinetta; S/N ZFFSG17A9J0078854; Black/Black leather; Estimate $125,000 – $175,000; Visually maintained, largely original, 3- condition; With Reserve; Not sold at Hammer bid of $97,500. – SF shields, later 5-spoke alloy wheels, air conditioning. – Very good repaint with some overspray around the hood and in the wheelwells. Lightly stretched original upholstery looks newer than the 24,095 miles on the odometer. There is a small area of microblisters on top of the rear fenders and the dashtop is badly sun rotted and pulling away from the defroster vents. Engine cover latch is broken. 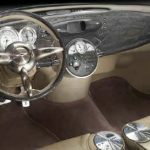 – Sold for $64,800 at Branson Spring in 2012, then $104,500 at the same auction in 2016, it dipped to $80,300 at Bonhams Amelia last year and has added just 23 miles to the odometer since then. The pre-sale estimate range here is irrational and the reported high bid should have been more than enough to see this rather disreputable Testarossa on its way to a new owner. Assuming that there was money at the underbid, say $95K, the seller even would have made a small profit after commission. 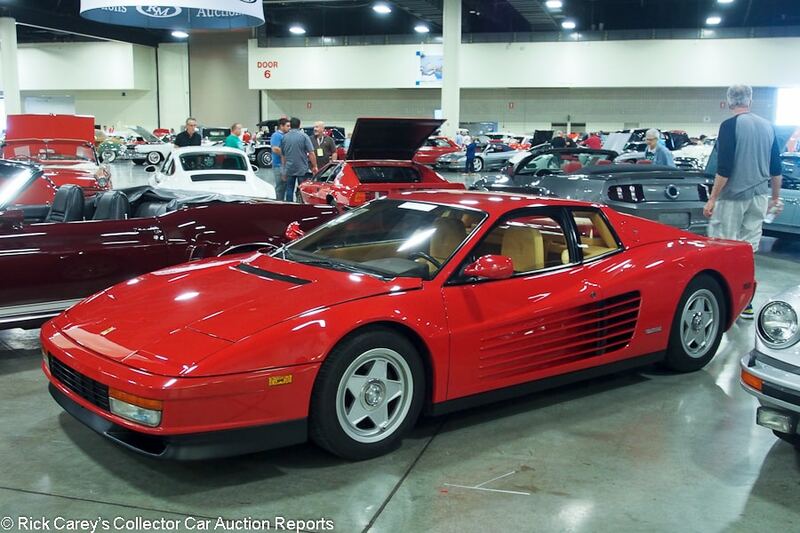 Now it’s just another Testarossa getting shopworn on its way to another auction. Lot # 3173 1987 Ferrari Testarossa Berlinetta; S/N ZFFSG17A0H0069261; Engine # 00554; Red/Tan leather; Estimate $100,000 – $120,000; Unrestored original, 3+ condition; With Reserve; Hammered Sold at $95,000 plus commission of 10.00%; Final Price $104,500. – Stock Ferrari alloy wheels, BFG tires, air conditioning. – 16,036 miles, all original. Very good original paint and chipguarded nose, lightly stretched original upholstery. The engine compartment is a little dusty and oil misted but orderly. Ferrari exhaust system. Road grimy underbody. – An honest Testarossa that brought an honest price for its modest mileage and originality. 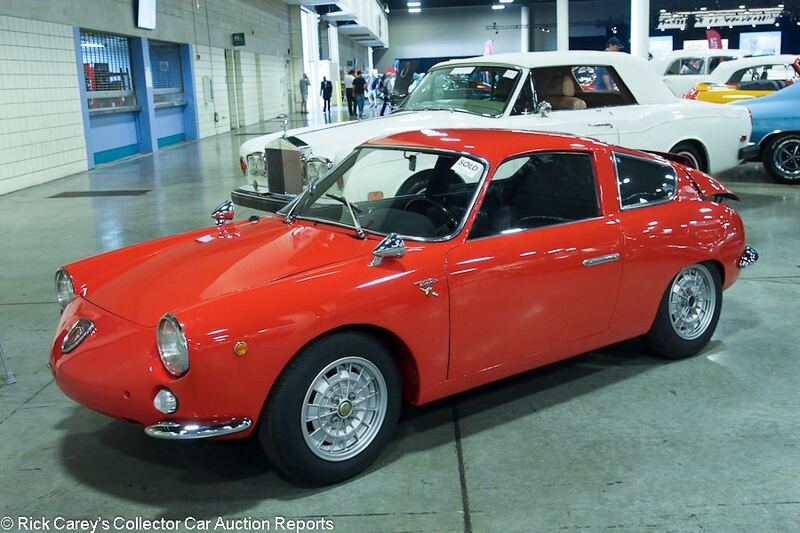 Lot # 1147 1962 Fiat-Abarth Monopile Scorpione Coupe; S/N 100249940; Red/Black; Estimate $110,000 – $120,000; Recent restoration, 3+ condition; With Reserve; Hammered Sold at $90,000 plus commission of 10.00%; Final Price $99,000. – 982cc/60hp sohc single Solex downdraft, Campagnolo alloy wheels, plastic rim steering wheel, Vredestein tires, Talbot fender mirrors, no seatbelts. – Sound paint except for microblisters on the roof, a few small fisheyes, touched up chips along the hood edge and shrinkage on the hood. Left door mirror mounting holes are filled with machine screws and painted over. Left door is filled and chipped along the front edge. The engine compartment has been restored like new and only lightly used. Not as good as its first impression. – An interesting Abarth with Bialbero-style round tail body and raised engine cover but lacking a few ponies from its 60hp single cam engine. The mechanical presentation is encouraging enough that it offsets its many cosmetic shortcomings. Some things, like the absence of seatbelts, support the statement that it came from a “collector of Abarths”, a car built for display, not driving, and that makes the price it brought generous, Record Monza money for a Monomille. 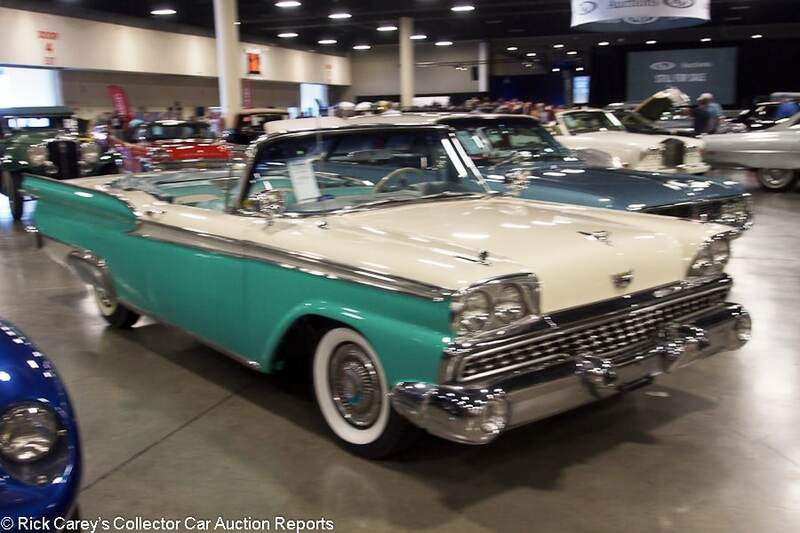 Lot # 1037 1959 Ford Galaxie Sunliner; S/N H9CC168061; White, Seafoam Green/Green, White vinyl; Black vinyl top; Estimate $32,000 – $36,000; Older restoration, 3- condition; With Reserve; Hammered Sold at $27,000 plus commission of 10.00%; Final Price $29,700. – 352/300hp, automatic, power steering, power brakes, dual remote spotlights, wheel covers, wide whitewalls, chrome skirts and gravel shields, cassette stereo. – Good older paint. Interior is old and shows it. The boot cover is falling apart and the chrome is old, dirty and neglected. The underbody and chassis have been done but are aged and neglected. The same can be said for the engine compartment. It won’t take much to make this a much better car. – Ford replaced the Fairlane 500 series early in 1959 with the Galaxie, which this is even though it was cataloged as a Fairlane 500. It was offered here four years ago when it brought a reported high bid of $36,000. Today’s result is reasonable for this Galaxie Sunliner’s equipment and its condition and at this price the new owner can afford to give it some of the love and attention it begs for. 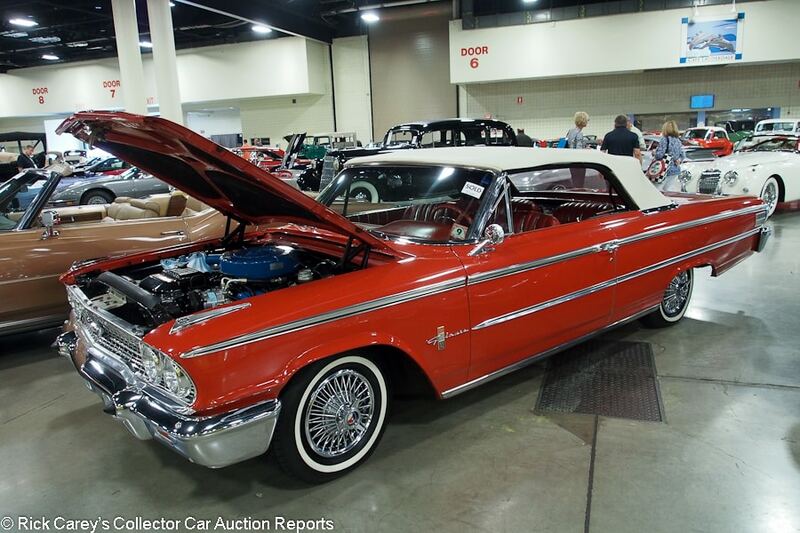 Lot # 1039 1963 Ford Galaxie 500 XL Convertible; S/N 3J69X146317; Red/Red vinyl; White vinyl top; Estimate $25,000 – $35,000; Visually maintained, largely original, 3 condition; With Reserve; Hammered Sold at $19,500 plus commission of 10.00%; Final Price $21,450. – 352/220hp, console shift automatic, power steering and brakes, Ford Selectaire air conditioning with a modern rotary compressor, wire wheel covers, narrow whitewalls, bucket seats, Ford AM-FM, dual outside mirrors. – Blemished, dull and waterspotted old repaint. Superficially redone engine compartment now with scratches, paint loss and grime. The underbody was repainted a while ago over the old undercoat. Good upholstery, interior trim, dash, gauges and steering wheel but for some reason it reeks of fuel oil. A sound driver with lots of room for economical improvement. – A fun Florida car that will be equally enjoyable in snowbird season with the top down and during the rest of the year with the top up and the R134A A/C pumping out cool breezes. It was bought right in this transaction and thorough attention to the dull old paint should bring out a shine that will enhance both its enjoyment and its value. 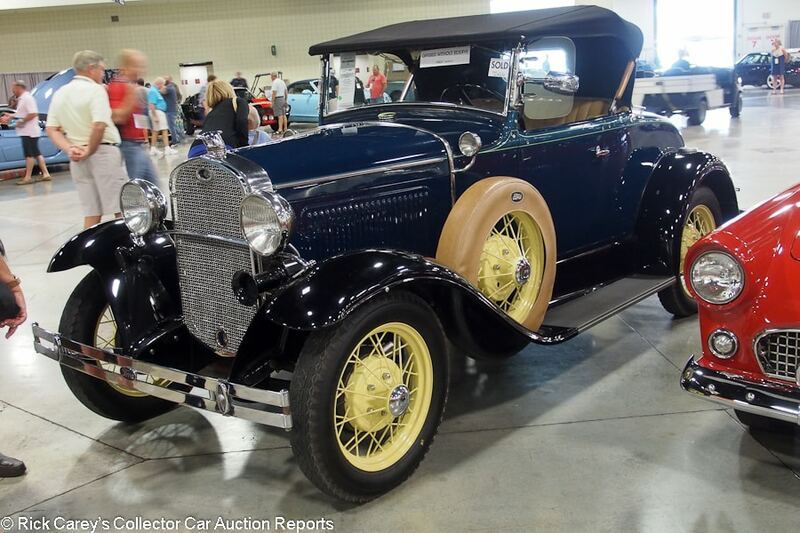 Lot # 1084 1931 Ford Model A DeLuxe Roadster; S/N CAS9340; Washington Blue, Blue accent, Black fenders/Beige vinyl; Black cloth top; Estimate $18,000 – $24,000; Cosmetic restoration, 4+ condition; No Reserve; Hammered Sold at $22,000 plus commission of 10.00%; Final Price $24,200. – Yellow wire wheels, blackwall tires, quail radiator cap, radiator stoneguard, dual sidemounts with vinyl covers, rumble seat, cowl lights, trunk rack, turn signals. – Flawed orange peely old paint. Sound but aged interior and top, scuffed chrome. Greasy, road grimy chassis. Dirty engine. Aged and neglected for some time, musty smelling. Usable but needs a lot. Assigned VIN. – Sold by RM at Meadow Brook in 2007 for $44,000, adding only 162 miles to the odometer since then but sadly neglected in the past eleven years. The 2007 result was surprisingly strong, and so is this for a car with so many obvious needs. 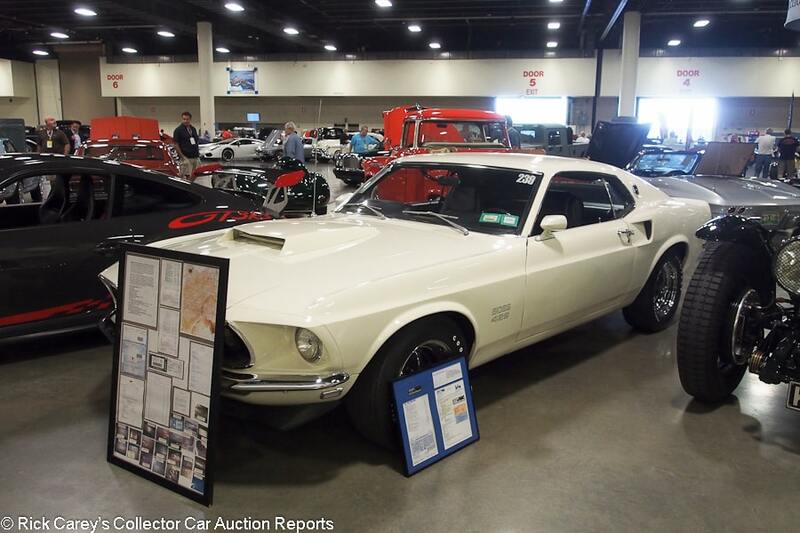 Lot # 1138 1969 Ford Mustang Boss 429 Fastback; S/N 9F02Z198745; Wimbledon White/Black vinyl; Estimate $240,000 – $280,000; Visually maintained, largely original, 2- condition; With Reserve; Not sold at Hammer bid of $190,000. – 429/370hp, 4-speed, pushbutton radio, Magnum wheels, Polyglas GT tires, power-steering and brakes. – Very good paint, chrome and interior. The wheel wells are painted but the chassis is original and aged. Mostly original and scrupulously maintained, represented as the original engine, Marti Report, window sticker and build sheet documented. – Boss Nine buyers must have been in Houston because the reported high bid here is irrelevant to this car’s originality and condition. 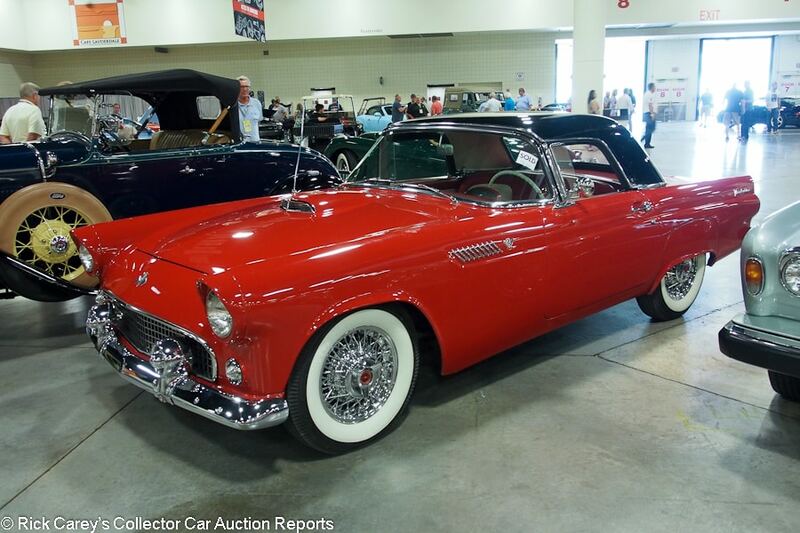 Lot # 1082 1955 Ford Thunderbird Convertible; S/N P5FH148999; Red, Black hardtop/Red, White vinyl; Black cloth top; Estimate $25,000 – $35,000; Visually maintained, largely original, 3- condition; With Reserve; Hammered Sold at $13,000 plus commission of 10.00%; Final Price $14,300. – 292/193hp, overdrive 3-speed, Hurst shifter, pushbutton radio, skirts, chrome wire wheels, whitewalls, Holley 4-barrel, two tops. – Hardtop is lightly scratched all over and has microblisters throughout as well as a few small dents. Dull chrome. Chip on top of the right headlight. Sap mark on the tail. Some light scratches on the front fenders. Clean underneath. Slightly dirty engine bay. Worn steering wheel. Warped dash. Metal parts of the interior are pitted. Fair hood and trunk fits. A shabby old T-Bird. – Sold by RM at Hershey in 2013 for $30,250, offered by Bonhams at Greenwich in 2015 with a reported high bid of $24,000 and sold by RM at Hershey last fall for $35,200, a staggering result for a neglected old T-bird. This is not a ‘Preservation’ vehicle, it’s been passed around accumulating 31 miles since 2015 and getting no attention at all. It deserved the price it brought here and maybe now will end up getting some attention. Lot # 3117 1957 Ford Thunderbird Convertible; S/N D7FH318326; Dusk Rose, Dusk Rose hardtop/White vinyl; Black cloth top; Estimate $50,000 – $60,000; Older restoration, 3+ condition; With Reserve; Hammered Sold at $43,500 plus commission of 10.00%; Final Price $47,850. – 312/245hp, automatic, chrome wire wheels, aftermarket A/C, Town & Country radio, power steering and brakes, engine dressup, two tops with porthole hardtop. – Restored some time ago and showing its age but with fresh paint. Fresh, shiny engine compartment, old underbody. Sound older interior. – RM sold this T-bird in its sale of Jerry Capizzi’s collection in 2006, scoring a home run with an inexplicable price of $71,500. It has received needed attention since then making it marginally better than it was and this result reflects its specifications and condition. 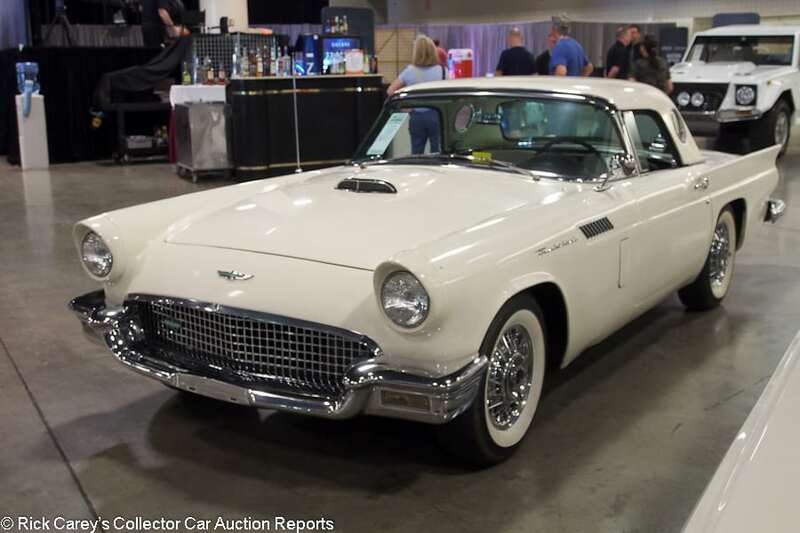 Lot # 3181 1957 Ford Thunderbird Convertible; S/N D7FH324553; White, White hardtop/White, Black vinyl; White vinyl top; Estimate $32,000 – $38,000; Visually maintained, largely original, 4+ condition; With Reserve; Hammered Sold at $26,500 plus commission of 10.00%; Final Price $29,150. – 312/245hp, automatic, power steering, both tops, porthole hardtop, chrome wire wheels, whitewalls, cassette stereo. – Poor old, chipped old repaint with blisters on top of both front fenders. Dirty original underbody. Weak chrome. Sound upholstery. Filled sills and lower body. A project car. 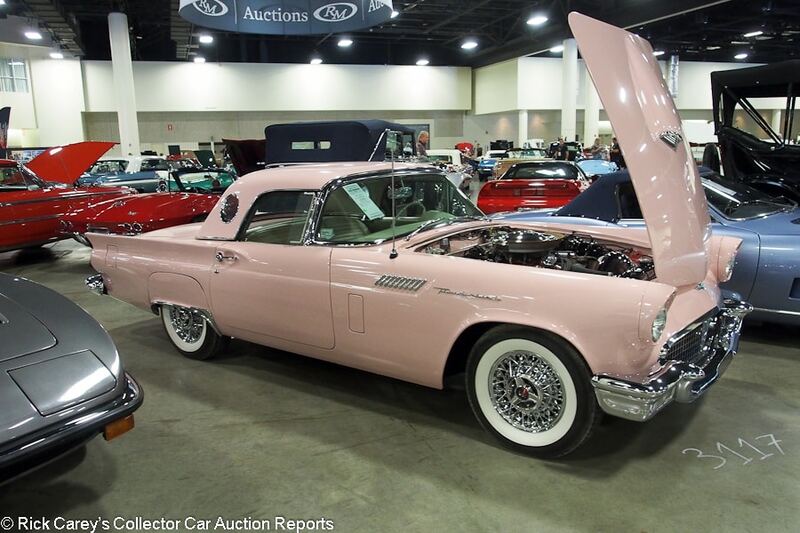 – It is telling to compare this ’57 T-bird with the Dusk Rose one sold a few hours earlier and for $18,000 more. It will take a lot more than $18K to make this tired, flawed T-bird even close to the Dusk Rose one, strongly reinforcing the notion that it is, financially at least, far better to buy a ‘done’ car than one that needs doing, even with a big discount. That’s not to say this car was expensive, its price is appropriate for what it is, which isn’t much. 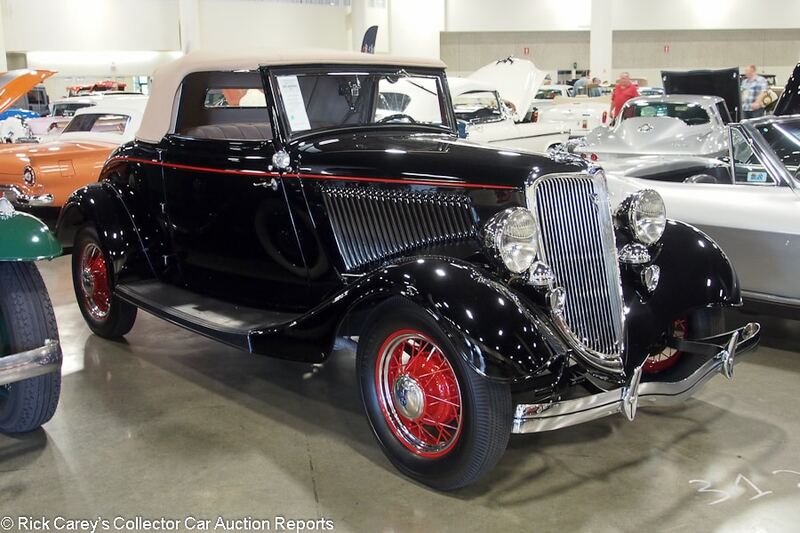 Lot # 3128 1934 Ford V-8 DeLuxe Cabriolet; S/N 18611393; Black/Beige cloth; Beige cloth top; Estimate $65,000 – $75,000; Concours restoration, 1- condition; With Reserve; Not sold at Hammer bid of $50,000. – Red wire wheels, blackwall tires, enclosed rear-mounted spare, rumble seat, dual taillights, radio, no heater. – Excellent paint, chrome, interior and top. The interior woodgrain sparkles. The engine compartment is a little dusty but could be nearly like new with some detailing. A way good example of a handsome and practical ’34 Ford. – This Ford needs nothing except a little cleanup under the hood and on the chassis. The restoration’s attention to detail is notable and the seller’s decision to keep it even at the reported high bid is understandable. It would not have been expensive even at the low estimate. 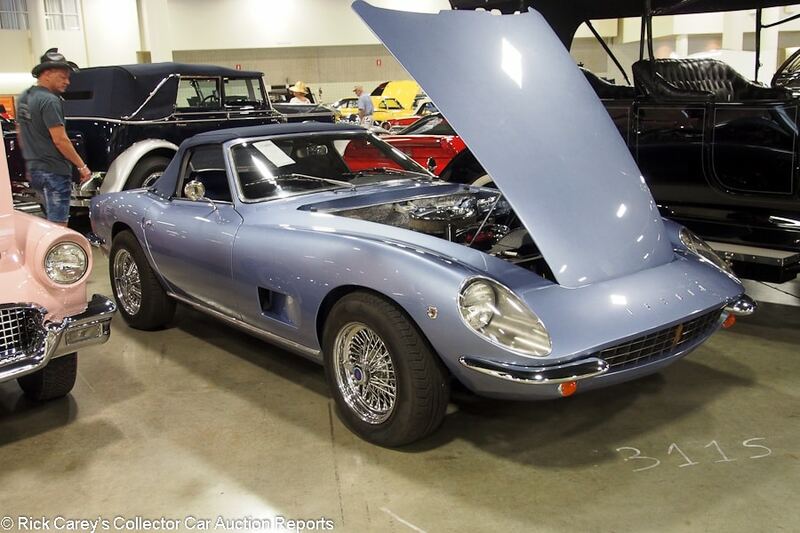 Lot # 3115 1971 Intermeccanica Italia Spyder; S/N 50367414; Ice Blue/Dark Blue leather; Dark Blue cloth top; Estimate $140,000 – $160,000; Cosmetic restoration, 3+ condition; With Reserve; Hammered Sold at $93,636 plus commission of 10.00%; Final Price $103,000. – 351 Ford, Tremec 5-speed, power steering, power brakes, chrome spoke wire wheels, Pirelli P4 tires, radio, air conditioning, power windows. – Good paint, major chrome, interior and top. Dirty, surface rusted wire wheels. Orderly but dusty engine compartment. Wheel wells painted body color over old undercoat. Superficially cosmetically restored two decades ago and neglected since. – Bid to $92,000 on the block and closed later at this result. As Italias go (and they go well and look beautiful) this result is a good value. The added 5-speed is more valuable for its driving practicality than the knock it puts on originality. 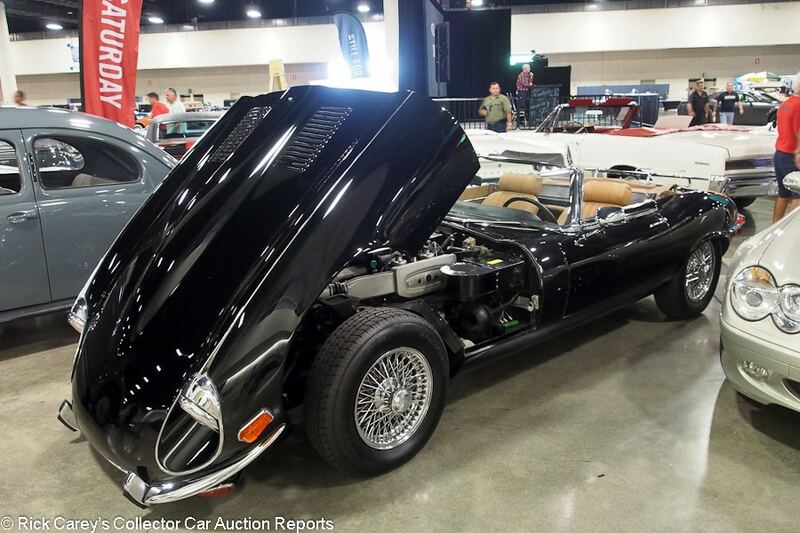 Lot # 3178 1974 Jaguar XKE SIII V12 Roadster; S/N UE1S26004; Black/Tan leather; Tan cloth top; Estimate $45,000 – $55,000; Visually maintained, largely original, 3- condition; With Reserve; Hammered Sold at $61,000 plus commission of 10.00%; Final Price $67,100. – Automatic, CD stereo, chrome wire wheels, no name tires, luggage rack, air conditioning. – Flawed, chipped old repaint, sound upholstery. Dirty engine compartment. A scruffy, used and not particularly well maintained old quickie cosmetic redo with lots of subsequent miles. – The bidders saw something in the SIII Jag that was not apparent to me, or to the usually optimistic pre-sale estimators. This is a magnanimous result for a scruffy car. Lot # 1161 1981 Jeep Wagoneer Limited 4-Dr. Station Wagon; S/N 1JCCE1SN1BT056361; Deep Maroon Metallic/Saddle vinyl, cloth; Estimate $25,000 – $30,000; Visually maintained, largely original, 3 condition; With Reserve; Hammered Sold at $17,000 plus commission of 10.00%; Final Price $18,700. – 258/110hp six, automatic, power brakes and steering, air conditioning, factory sunroof, roof rack, alloy wheels, Warn locking front hubs, aftermarket cassette stereo. – Competently repainted with new woodgrain, otherwise original, clean and orderly. Sound original interior, decent brightwork, orderly engine compartment. 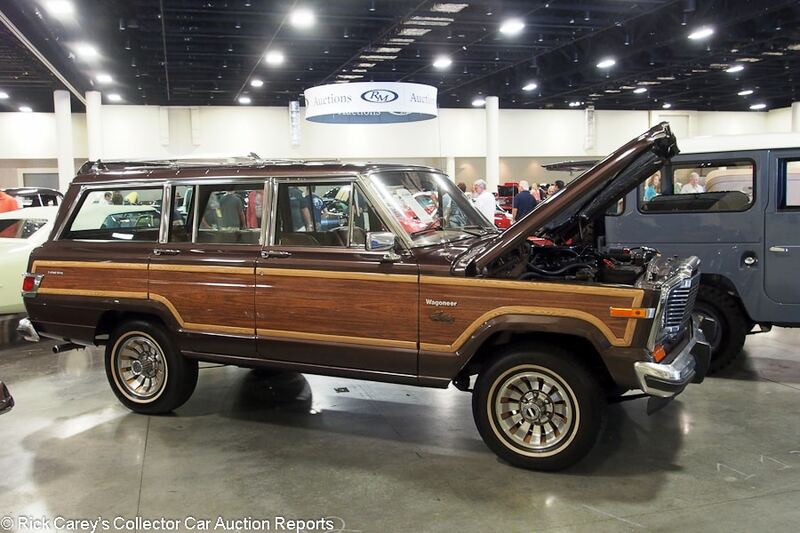 – Most Wagoneers of this era have returned to the earth as iron oxide so finding one this original and sound is something of a Eureka moment, one that seems to have been lost on the Ft. Lauderdale bidders, except for the new owner who was seriously thrilled and contemplating driving it the 1,200 miles home (enthusiastic, and optimistic, too.) It is a very good value here, even something of a bargain. 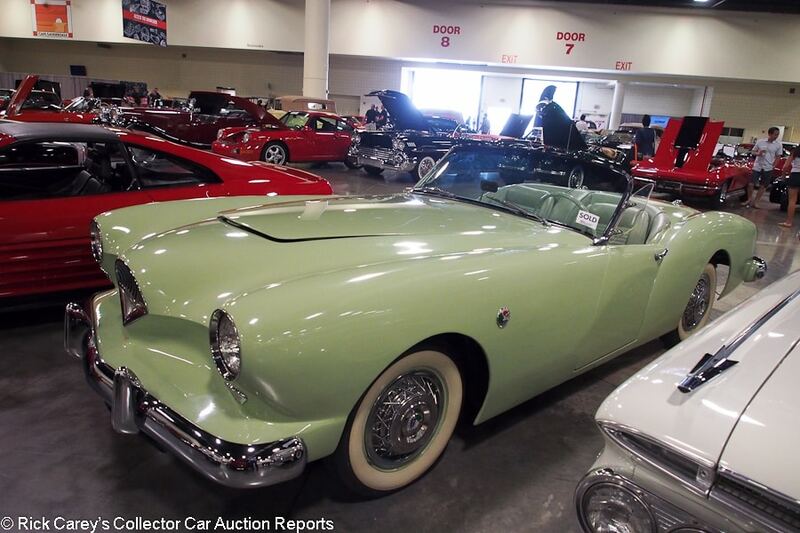 Lot # 1071 1954 Kaiser-Darrin 161 Roadster; S/N 161001105; Light Green/Light Green vinyl; Estimate $90,000 – $120,000; Visually maintained, largely original, 3- condition; With Reserve; Hammered Sold at $76,000 plus commission of 10.00%; Final Price $83,600. – Wire wheel covers, wide whitewalls. – Ripply, orange peely old repaint over sketchy prep. Sound old interior. Weak chrome. Old undercoat in the wheelwells. Sound and complete, the ideal basis for a restoration. – It’s difficult to get excited about this old Kaiser-Darrin but it brought an entirely appropriate price here in Ft. Lauderdale. Now the real work begins. Lot # 3031 1955 Keck Streamliner “Fuel Injection Special” Indy Car; S/N None; Red, /; Estimate $80,000 – $100,000; Rebodied or re-created, 3+ condition; No Reserve; Hammered Sold at $32,000 plus commission of 10.00%; Final Price $35,200. – Maserati V-8, Miller centrifugal supercharger, centerlock magnesium disc wheels. – A charming and imaginative silhouette replica of Quinn Empery’s 1955 Fuel Injection special built for Howard Keck and intended, but never used, for Indianapolis by Bill Vukovich. Attractively presented in good museum-display condition. Enclosed body, driver-controlled tail flap. – The real car was sold in 1997 by Christie’s at Pebble Beach for $129,000. How close this replica is to the real one is hard to tell without having both side by side, but it is close enough that even two decades later I recognized it and searched through the database to find the earlier transaction. The 4-cam Maserati V8 is a departure from original spec (the original had a 270 Offy four) and the gorgeous Miller centrifugal blower is tucked under the nose bodywork and hard to see. It’s probably just a display car that would require extensive work to be sure it is safe to run and drive, but, oh, what an experience it would be, particularly manipulating the two gear levers, one for reverse and 1st and a second one for 3rd and 4th. It is a delightful and intriguing ‘evocation’ on which boxes of Dzus and allen head fasteners have been used and it is, even if it never runs, a charming object at this price. 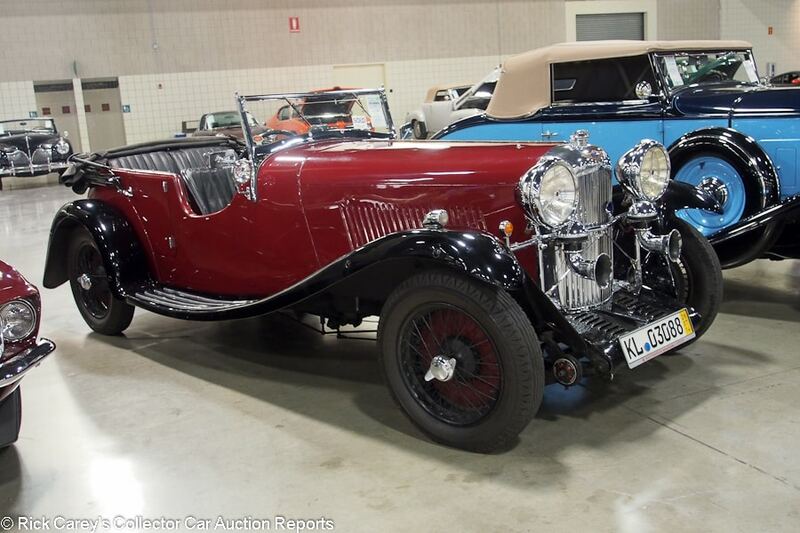 Lot # 3085 1934 Lagonda 16/80 S Type Special Six 4-seat Tourer; S/N S10886; Burgundy, Black fenders/Black leather; Black cloth top; Estimate $80,000 – $90,000; Older restoration, 4+ condition; With Reserve; Hammered Sold at $72,500 plus commission of 10.00%; Final Price $79,750. – RHD. 1,991/68hp six, black wire wheels, Firestone bias ply tires, opening windshield, rear-mounted spare, dual taillights, turn signals, Lucas headlights. – Tired old paint with abundant chips, scrapes, cracks and fisheyes. Sound old upholstery and faded top. Clear gauges. Road grimy chassis and engine. Generally good chrome except for the horn trumpets and radiator shell. Usable as is and pretty much any work will have an outsized effect on its presentation. The body is sound aside from some bumps and bruises. 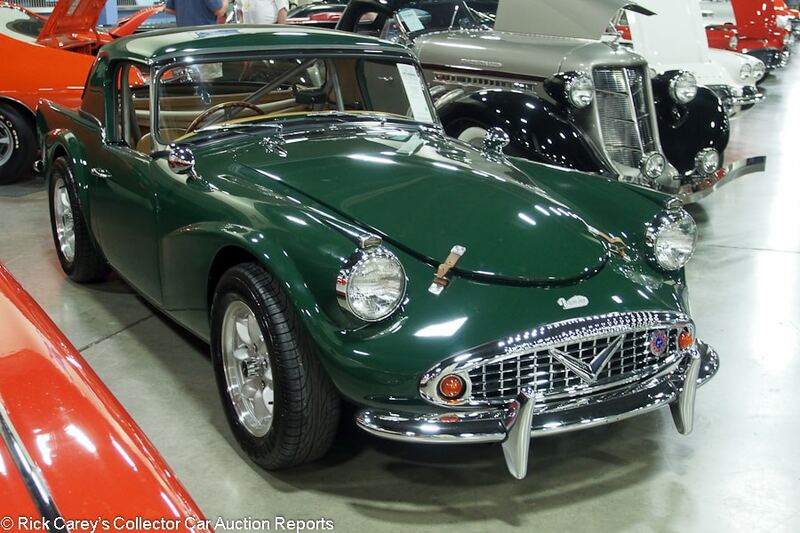 – Reported sold by Coys in London in 1991 for $65,961 with British TV series history in “Campion”. It doesn’t look like much has been done to it, but a lot done with it to judge from the chips and bumps. A classic Lagonda that will get its new owner into the same events as much more expensive (and faster) cars of the era with plenty of room for work on it to make it look better. A realistic purchase of a car with potential. 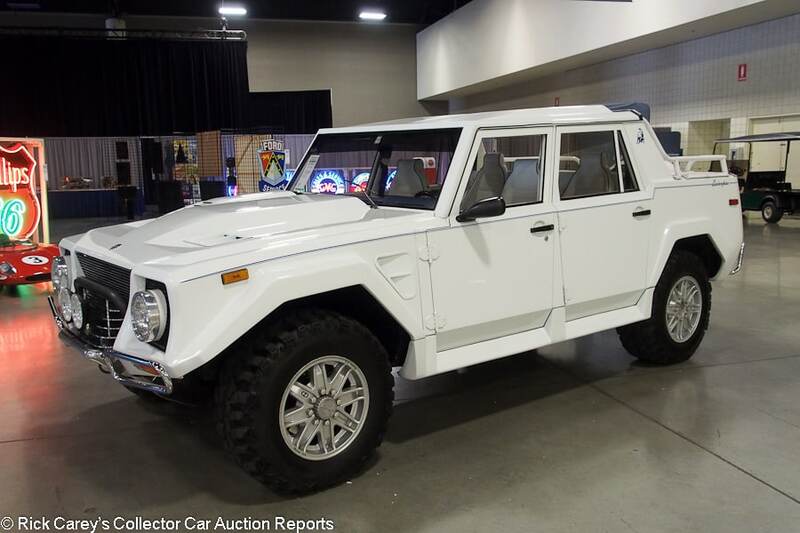 Lot # 3155 1990 Lamborghini LM002 America Utility; S/N ZA9LU45AXLLA12243; White, Blue coachlines/White leather; Estimate $335,000 – $375,000; Visually maintained, largely original, 3 condition; With Reserve; Hammered Sold at $335,000 plus commission of 10.00%; Final Price $368,500. – Air conditioning, power windows, 0.Z. wheels, Super Swamper tires, vinyl covered rear-mounted spare, Hella driving lights. – Sound repaint over old paint. Redyed and slightly soiled original interior. Road grimy original underbody, chassis and engine. Cataloged as an LM002/America, but the instruments are metric. – LM002s have, for whatever reason, been undergoing a resurgence of interest. This one was offered by Russo and Steele in Monterey in 2015 where it brought a reported high bid of $240,000 without selling. Here it brought nearly 50% more on the hammer and sailed right up to the usually optimistic pre-sale low estimate, an example of the level of interest being shown in the LM002. This one is pure white (with a little blue striping) such that it would immediately disappear into the background upon being deployed in a blizzard. At this price it is doubtful it will see much snow, or dirt, or rocks, but it’ll fit right in on Rodeo Drive. 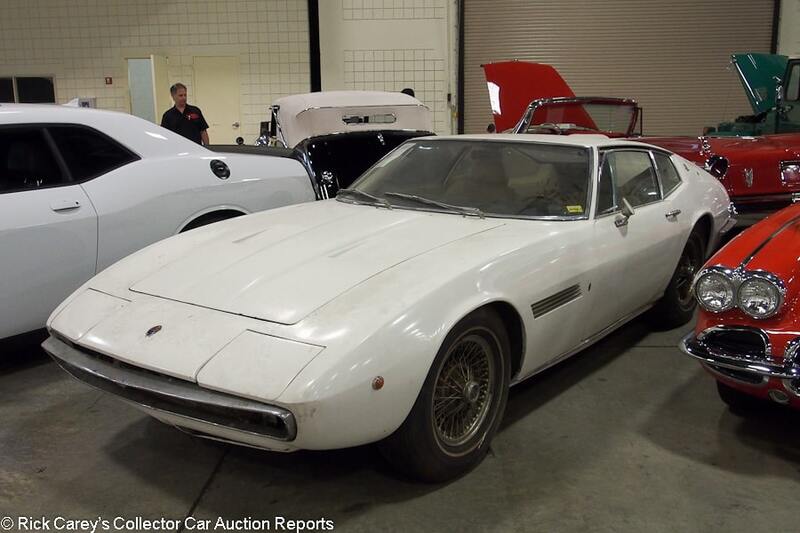 Lot # 1139 1970 Maserati Ghibli 4.7 Coupe; S/N AM1151590; White/Beige leather; Estimate $100,000 – $120,000; Unrestored original, 4 condition; With Reserve; Hammered Sold at $110,000 plus commission of 10.00%; Final Price $121,000. – Cassette stereo, Borrani wire wheels, narrow whitewalls. – Dirty barn find. Stiff, surface cracked original leather. Rusty chrome. Repaired left front fender, rusty right sills. Good only for a restoration – At this price the bidders rightly discounted the Bondo-filled sills, and paid nothing for the grime and dirt that is so popular today. Much less expensive even than today’s slightly depreciating Daytonas, the gorgeous coachwork is a bonus. 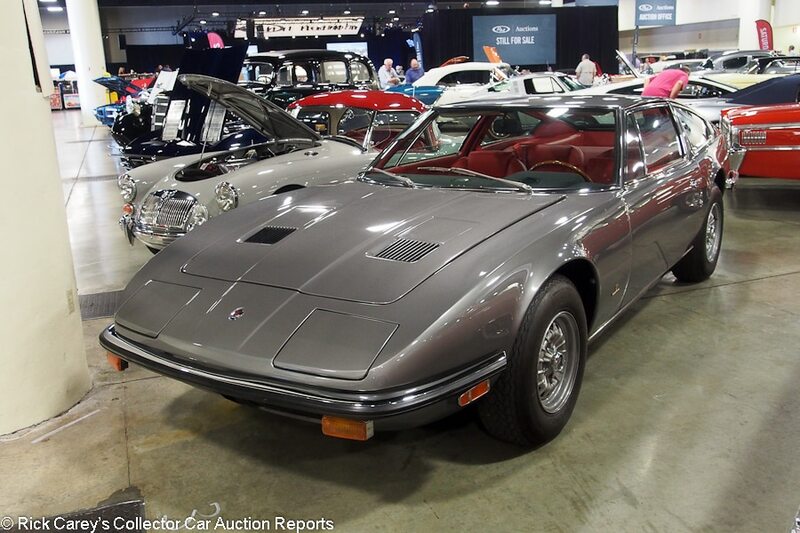 Lot # 3118 1971 Maserati Indy 4.9 Coupe, Body by Vignale; S/N AM116491208; Gunmetal Grey/Red leather; Estimate $125,000 – $150,000; Cosmetic restoration, 3+ condition; With Reserve; Not sold at Hammer bid of $100,000. – Blaupunkt multiband radio, power windows, Borrani alloy wheels, power steering, air conditioning. – Fair repaint with little fisheyes and water spots. Good bumper chrome but scuffed trim and pitted door handles. Orderly engine compartment showing some age. Old undercoat in the wheelwells. Inviting new interior with only a little use and great leather smell. – Reported bid to $160,000 at Mecum’s Monterey auction last August and more recently bid to $95,000 at Mecum’s Los Angeles sale, someone spent a fortune on this Indy and it is worth something in the region of the low estimate. 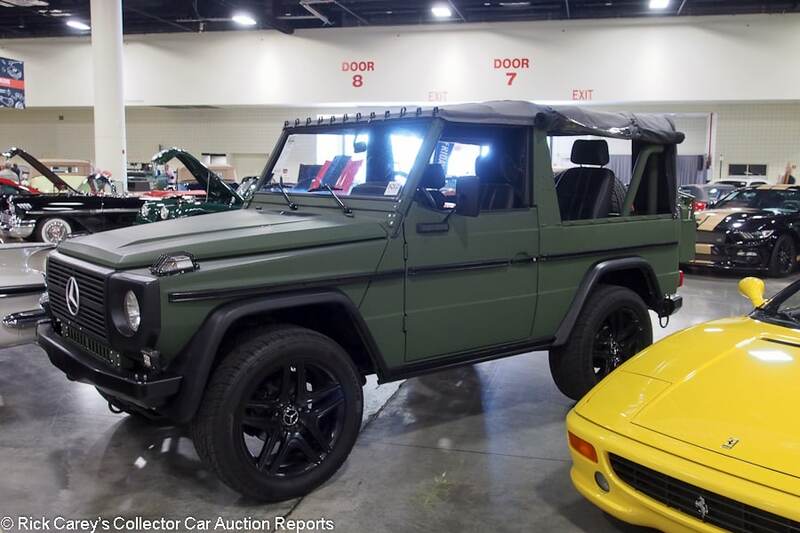 Lot # 1067 1991 Mercedes-Benz 250 GD Utility; S/N WDB46140117076736; Matte Olive Green/Black vinyl; Dark Grey cloth top; Estimate $40,000 – $45,000; Truck restoration, 2- condition; With Reserve; Hammered Sold at $60,000 plus commission of 10.00%; Final Price $66,000. – 5-cylinder diesel, 5-speed, Kenwood CD stereo, 20 inch aftermarket alloy wheels, Sailun tires, LED auxiliary lights, four bucket seats, rollbar, rear-mounted spare and small Jerry can. – The chassis is restored like new. The right front fender is broken (in the auction lineup). The paint is good, the interior is better. – These G-wagens were mostly built for military use, with concomitant levels of ruggedness and off-road capability. Its value is hard to rate, except against a restored Land Rover or Land Cruiser which also fall in the range of this transaction. At the next mud run, though, this is likely to be the only 250 GD, and exclusivity has its value. 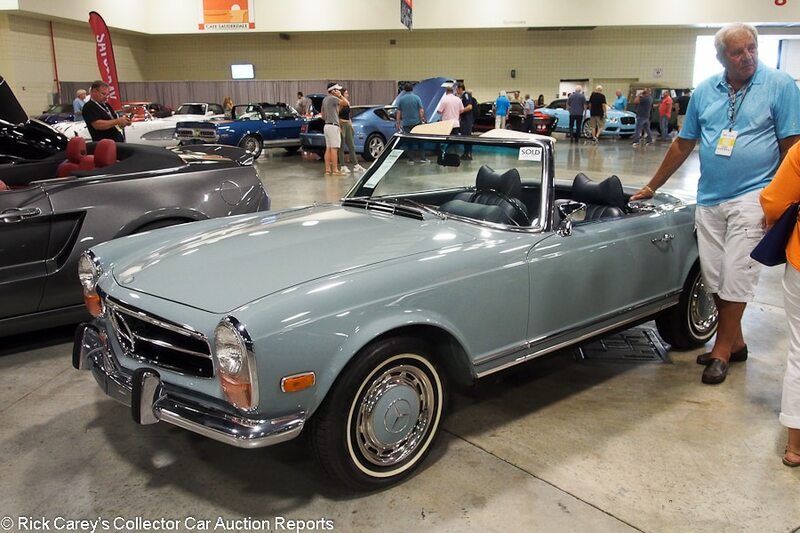 Lot # 3064 1971 Mercedes-Benz 280SL Roadster; S/N 11304412023576; Horizon Blue, Horizon Blue hardtop/Blue vinyl; Blue cloth top; Estimate $80,000 – $100,000; Recent restoration, 2- condition; With Reserve; Hammered Sold at $83,000 plus commission of 10.00%; Final Price $91,300. – Automatic, Becker Europa AM-FM, wheel covers, narrow whitewall Hankook tires, bumper overriders, power steering, power brakes, two tops. – Fair repaint with small fisheyes and car cover texture on the hood. Weak, dull chrome and bright trim. Good upholstery, glossy interior wood trim. The engine and chassis are restored like new. A good car let down by the paint on the hood and some weak chrome. – Sold by Auctions America at Santa Monica in 2016 for $104,500, a superior price for the equipment, flawed paint and weak chrome, and much more reasonably priced here. Lot # 3129 1970 Mercedes-Benz 280SL Roadster; S/N 11304410014474; Red, Red hardtop/Black leather; Black top; Estimate $60,000 – $80,000; Visually maintained, largely original, 3- condition; No Reserve; Hammered Sold at $42,000 plus commission of 10.00%; Final Price $46,200. – 4-speed, both tops, air conditioning, color keyed wheel covers, Michelin tires, Becker Europa radio. – Sound but erratically masked paint, sound original upholstery. Grungy unrestored engine compartment and chassis. While it needs a lot, it doesn’t need a restoration, yet. – Bought for about $45,000 less than the much better 280SL sold a few hours earlier, as it deserved to be. It’s going to be difficult to resist the temptation to spend money on it to make it better, which leads to more money being spent ‘while it’s apart’. 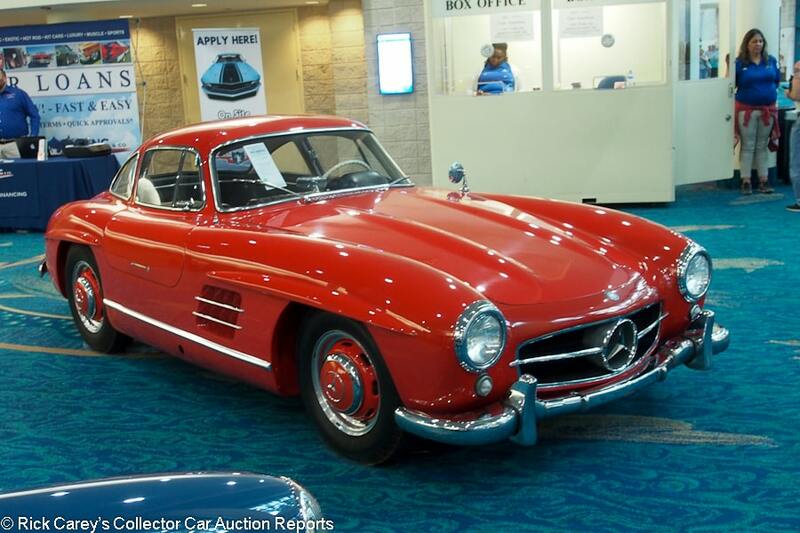 Lot # 3158 1957 Mercedes-Benz 300SL Gullwing; S/N 1980407500071; Engine # 198980700075; Red/Brown leather; Estimate $1,000,000 – $1,300,000; Visually maintained, largely original, 3- condition; With Reserve; Hammered Sold at $1,085,000 plus commission of 10.00%; Final Price $1,193,500. – Polished rim body color wheels and hubcaps, Becker Mexico radio, bumper overriders, hinged steering wheel. – Same owner since 1968. Sound and carefully preserved redyed original upholstery with abundant patina. Indifferent old repaint Dented right rear fender with a long scratch. Stone clipped nose, sound but aged chrome. Wavy left door, dented left rear wheel eyebrow. Chipped hood edges. Probably too good to restore, but not by much. Proceeds donated to the Jackson, MI YMCA. – This Gullwing shows 36,741 miles, probably original, and has been displayed for decades at the ACD Museum in Auburn, Indiana. Its combination of known history from new, preservation and originality make it particularly desirable and fully justify this price. 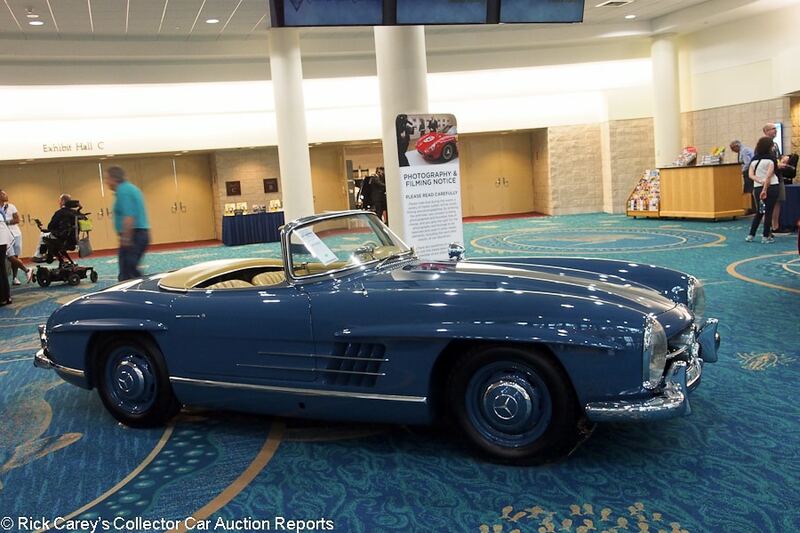 Lot # 3131 1962 Mercedes-Benz 300SL Roadster; S/N 19804210003069; Engine # 19898210000024; Blue/Light Yellow leather; Blue cloth top; Estimate $1,200,000 – $1,500,000; Visually maintained, largely original, 3+ condition; With Reserve; Hammered Sold at $1,400,000 plus commission of 10.00%; Final Price $1,540,000. – Becker Grand Prix multiband radio, body color wheels and hubcaps, Michelin XWX tires, Talbot outside mirror, Euro headlights, bumper overriders. – Represented as 36,988 miles from new. Disc brakes, alloy engine block. Very good older clearcoat repaint with body color haphazardly applied in the wheel wells. Very good original interior, lightly creased but sound. Good chrome and newer top. The engine compartment is aged but orderly. – The last and most desirable specification of the 300SL, this Roadster is pleasingly maintained and presented in reassuring condition that evidences a life with careful, caring owners who gave it what it needed without compromising its originality where possible. This is by any measure a superior 300SL Roadster and it brought a deserved superior price with an appropriate premium for its benign history. Lot # 1042 1959 MG A Roadster; S/N HDR4367402; Light Blue/Dark Blue leather; Estimate $20,000 – $30,000; Cosmetic restoration, 3 condition; With Reserve; Hammered Sold at $15,000 plus commission of 10.00%; Final Price $16,500. – 1489/72hp, Silver steel wheels, hubcaps, Classic blackwall tires, radio antenna but no radio. – Good repaint and interior, crisp gauges. Weak, dull chrome and bright trim. Chassis superficially squirted black while assembled. Wheel wells painted body color a while ago and now dirty and surface rusted. An auction MGA. – Bought for an auction MGA price. 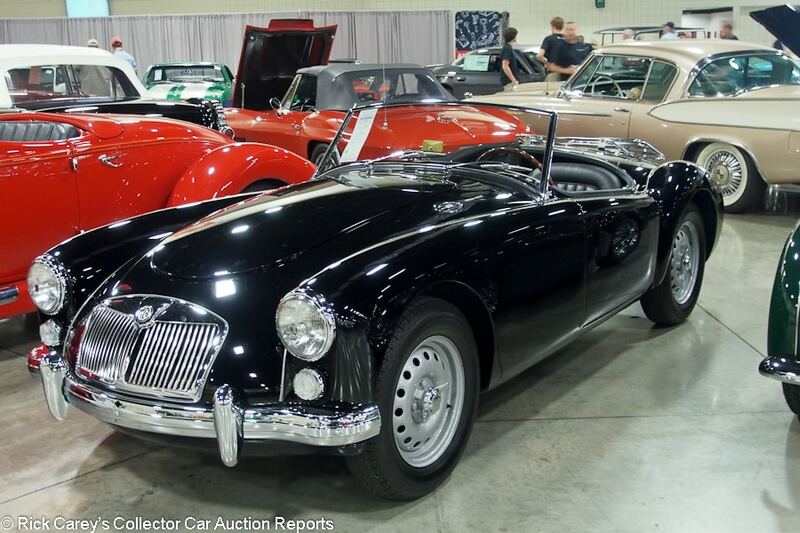 Lot # 3073 1959 MG A Twin Cam Roadster; S/N YD32352; Black/Black vinyl; Black cloth top; Estimate $70,000 – $80,000; Recent restoration, 2- condition; With Reserve; Hammered Sold at $50,000 plus commission of 10.00%; Final Price $55,000. – Centerlock Dunlop alloy wheels, Dunlop tires, luggage rack. – Good paint, chrome and interior. Color change indicated by the BMIHT certificate. A long term restoration for a deceased owner that shows the restoration’s age even though it has barely been driven. 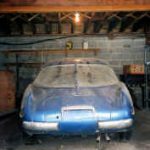 – This MGA Twin Cam illustrates the problem with a restoration that takes decades: by the time it’s done the first work completed is old. Nonetheless, it is competently and thoroughly done and fully deserves the price it brought here. 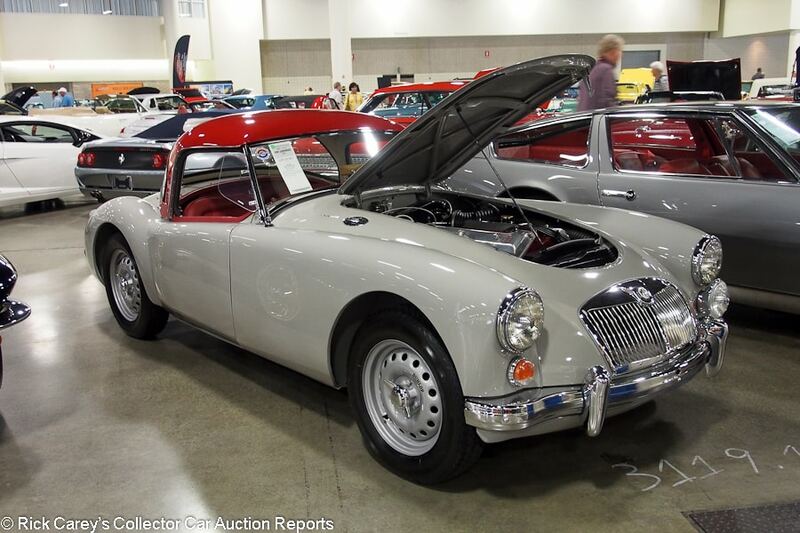 Lot # 3119.1 1959 MG A Twin-Cam Roadster; S/N YD32236; Light Grey, Crimson hardtop/Crimson leather; Dark Blue cloth top; Estimate $65,000 – $80,000; Recent restoration, 2+ condition; With Reserve; Not sold at Hammer bid of $53,000. – Dunlop centerlock alloy wheels, Vredestein tires, two tops, Lucas fog light and headlights, Radiomobile dual band radio, windwings. – Excellent paint, chrome and interior. The engine compartment and chassis are like new, with only a hint of age. This Twin Cam’s restoration is a bit of a quandary: an over the top restoration that isn’t over the top. – The bidders seem to have had a similar problem in evaluating this Twin Cam’s presentation and chose to bid conservatively. The seller’s decision to keep it at the reported high bid is understandable. Lot # 3137 1953 Oldsmobile Ninety-Eight Fiesta Convertible; S/N 539M37898; Ivory, Metallic Blue/White, Blue leather; White vinyl top; Estimate $220,000 – $250,000; Cosmetic restoration, 3 condition; With Reserve; Not sold at Hammer bid of $110,000. 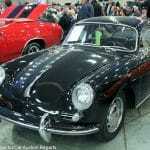 – Automatic, power steering and brakes, pushbutton radio, power antenna, power windows, skirts, continental kit. – Good paint, chrome and interior. Uneven door fits and a big touched up scrape on the back edge of the passenger’s door. The underbody is still in ancient undercoat and has not been restored. Paint chips at the front right hood corner and along the hood sides. What can be seen under the hood is fresh and clean, what can’t be seen is old. An auction car. – Sold by RM at Hershey last fall for $132,000. The pre-sale estimate implies either that it was a bargain then (it wasn’t), or that the Fiesta market has experienced a quantum leap in just six months while adding 10 miles to the odometer. The reported high bid here is unrealistically light, even for the cosmetic restoration of this Fiesta, but expecting to get any more than the Hershey price is also unrealistic. The low estimate should buy the best ’53 Fiesta in the world. 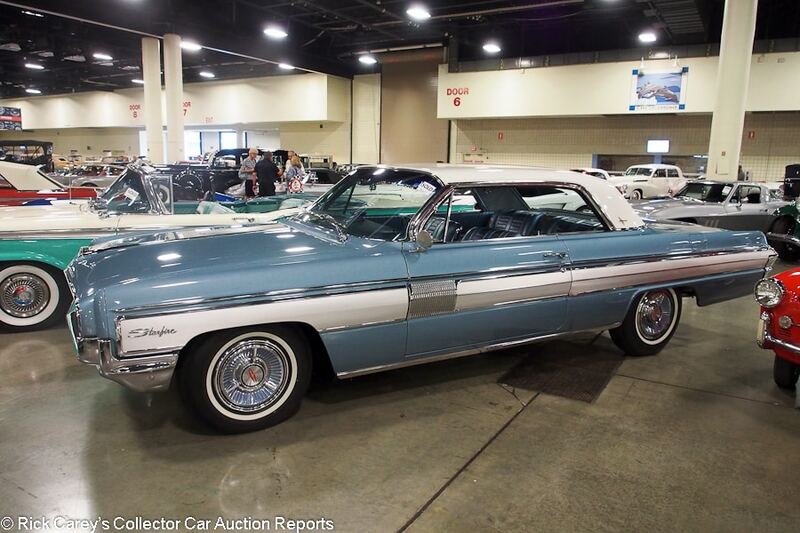 Lot # 1036 1962 Oldsmobile Starfire 2-Dr. Hardtop; S/N 626M05488; Cirrus Blue, Provincial White roof/Ice Blue leather; Estimate $40,000 – $50,000; Recent restoration, 2 condition; With Reserve; Hammered Sold at $35,000 plus commission of 10.00%; Final Price $38,500. – 394/345hp, automatic, power steering, power brakes, WonderBar radio, power driver’s seat, air conditioning, Autronic Eye, cruise control, power windows, buckets and console, wheel covers, narrow whitewalls, power antenna. – Very good paint, chrome interior, dash, gauges. Beautifully done everywhere and lavishly equipped. – Worldwide sold this Starfire in Houston in 2010 for $28,600 and it brought a representative price for its condition and exhaustive options list here in Ft. Lauderdale. Lot # 1063 1936 Packard Super Eight Coupe 2/4 Passenger; S/N Engine No. 757396; Engine # 757396; Cream, Maroon fenders and roof/Cognac Ostrich leather; Estimate -; Older restoration, 2- condition; No Reserve; Hammered Sold at $51,000 plus commission of 10.00%; Final Price $56,100. – Dual enclosed sidemounts with mirrors, body color wire wheels, wide whitewalls, rumble seat, rollup rear window, luggage trunk on folding rack, turn signals, two sets of Trippe lights, radio, no heater. – Very good older paint, small cracks along the hood edges, quarter sized dent on the right front fender. Good chrome although the hood side vents were chromed over small unfilled pits. Excellent dash, gauges, interior wood and upholstery with a fluid stain (probably champagne) on the passenger’s seatback. The rumble seat is upholstered in vinyl. The chassis and engine were restored then have been driven. The chassis is dirty. A quality restoration with some miles. 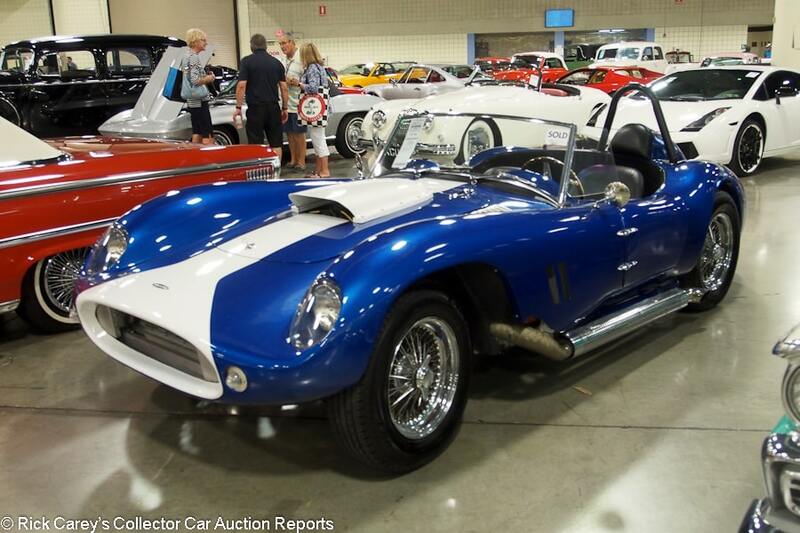 – RM reported this car sold at Hershey six months ago for $70,400. It was a late addition to Ft. Lauderdale sale, seemingly overlooked by the bidders who may not have appreciated the coupe coachwork, or the rather garish livery. Either way it’s a great value to the new owner and a bargain priced entry in CCCA events and tours. 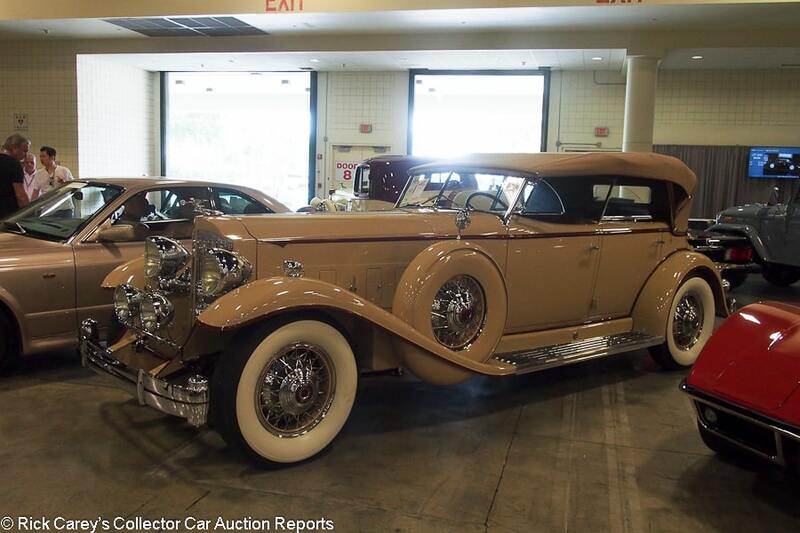 Lot # 1133 1932 Packard Twin Six Individual Custom Sport Phaeton, Body by after Dietrich; S/N 900362; Engine # 900353; Beige, Brown accent, Red coachline/Brown leather; Beige cloth top; Estimate $375,000 – $425,000; Rebodied or re-created, 2+ condition; With Reserve; Hammered Sold at $340,000 plus commission of 10.00%; Final Price $374,000. – Chrome wire wheels, wide whitewalls, Pilot-Rays, dual enclosed sidemounts with mirrors, rollup rear windshield with wings, dual taillights, trunk rack. – Reproduction body by California Metal Shapers for Dave Tobin in 1986. Excellent paint, chrome, interior and top. Chassis and underbody are better than new without going overboard. – Sold by RM at Hershey in 2015 for $440,000 and now showing just 25 more miles than it did then. It has obviously been kept in a benign environment and looked after even if it hasn’t been driven and represents full value for money in this transaction. 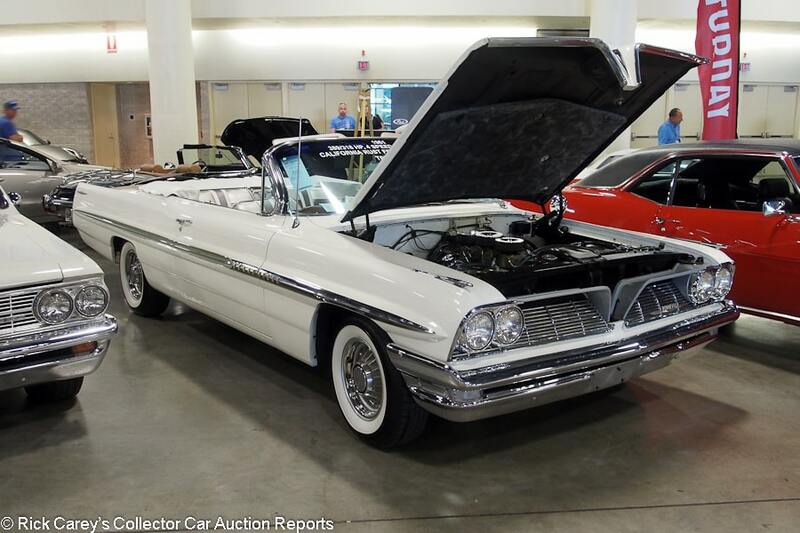 Lot # 3149 1961 Pontiac Bonneville Convertible; S/N 861S6963; Engine # 163340 AI; White/Silver, Grey vinyl; White vinyl top; Estimate $50,000 – $55,000; Cosmetic restoration, 3+ condition; With Reserve; Hammered Sold at $36,364 plus commission of 10.00%; Final Price $40,000. – 389/318hp, Tri-Power, 4-speed, Hurst shifter, buckets, no console, 8-lug wheels, whitewalls, pushbutton radio remote outside mirror, power steering and brakes. – Correct intake and carbs but probably added to the 267hp ‘AI’ coded block. Decent repaint, touched up chip on top of the left front fender. Good major chrome, scuffed rear bumper and side trim. Orderly engine compartment but the chassis is unrestored and filthy. – With the Tri-Power 389, 4-speed and 8-lug wheels this is a desirable Pontiac even if its condition leaves a lot to be desired. It was sold by Mecum in Las Vegas in November for $27,500 then crossed the Kissimmee block three months ago where it was reported bid to $40,000. The consignor got the message here in Ft. Lauderdale and acceded to this post-block offer which still turned a tidy profit for five months’ ownership. 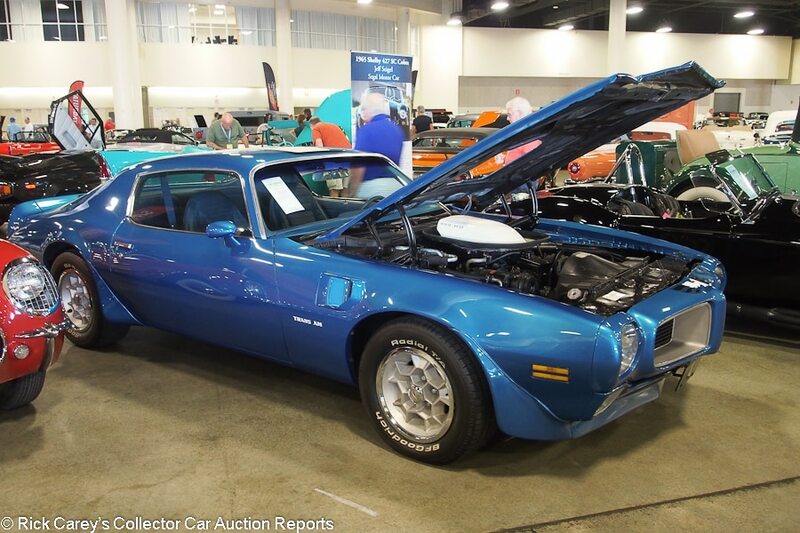 Lot # 3142 1971 Pontiac Trans Am 455 H.O. 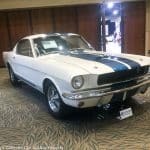 Coupe; S/N 228871N108834; Blue, White, Black stripes/Blue vinyl; Estimate $55,000 – $65,000; Visually maintained, largely original, 3 condition; With Reserve; Not sold at Hammer bid of $47,000. – 455/335hp, automatic, tires, white shaker hood. Pioneer cassette stereo, power steering and brakes, air conditioning, honeycomb wheels, Radial T/A tires, white shaker hood. – Good repaint, original interior with a mended tear in the driver’s armrest. One crack on the Endura nose. The painter sanded every inch of the windshield and rear window trim. The engine has been out and neatly done but put back in a clean but largely original engine compartment and chassis. A quickie redo that doesn’t show much care or attention. – Bid to $47,500 at Auburn Fall seven months ago and the consignor isn’t hearing what the bidders are saying. The windshield and rear window are so carelessly scarred up that it calls into serious question what other shortcuts were taken on stuff that’s harder to see. It is time to take any real money offered and move on. 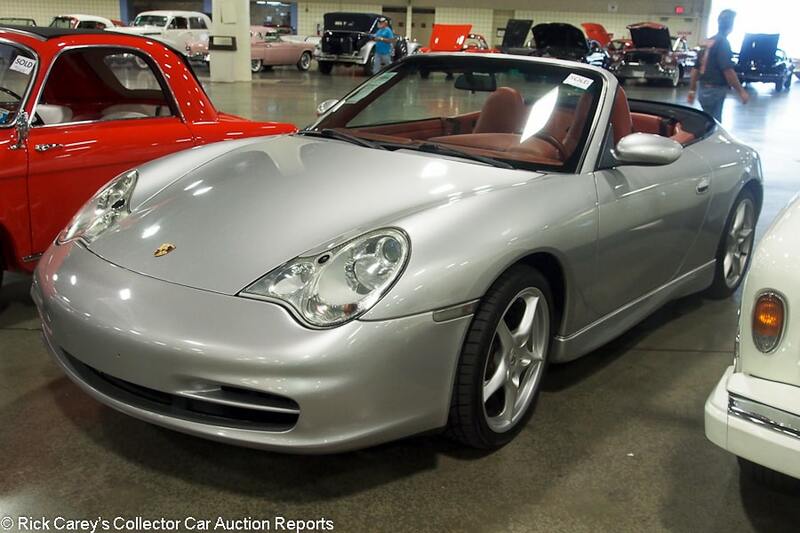 Lot # 1033 2003 Porsche 911 Carrera Cabriolet; S/N WP0CA29953S652371; silver/Burgundy leather; Black cloth top; Estimate $15,000 – $20,000; Unrestored original, 3+ condition; No Reserve; Hammered Sold at $19,000 plus commission of 10.00%; Final Price $20,900. – Tiptronic, Kenwood stereo, alloy wheels, Sumitomo tires. – Chipguarded front bumper but not the hood which has two major chips and a number of smaller nicks. Paint and interior are original and good; headlight covers are clear. A clean used car but with unknown mileage or service history. – Nasty Tiptronic and an opaque ownership and service history and mileage make this a Porsche to be approached with caution, which the Ft. Lauderdale bidders didn’t do, paying full retail for the car. 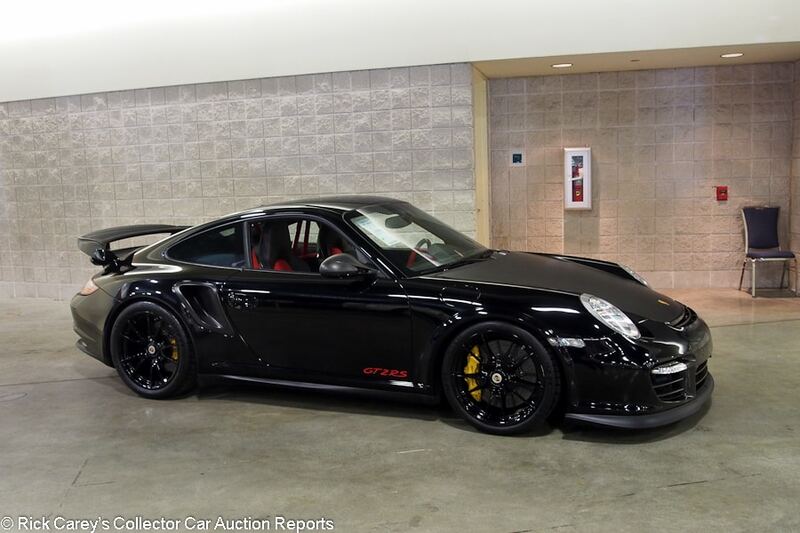 Lot # 3150 2011 Porsche 911 GT2 RS Coupe; S/N WP0AE2A94BS778064; Black/Black leather, Red Suede inserts; Estimate $425,000 – $475,000; Unrestored original, 2- condition; With Reserve; Not sold at Hammer bid of $400,000. – Carbon fiber hood and outside mirrors, CD stereo, yellow calipers, Sound Package Plus, sport seats, roll cage. – Represented as under 7600 miles. Good original paint without stone chips. Suede inserts and steering wheel rim are slightly soiled. – 911 GT2 RS prices are generally within the pre-sale estimate range here, but the decision to pass up $400K, if there was money at that bid, may not comport with reality in a market where there is no shortage of these 620hp stormers or other similar high performance Porsche variants. 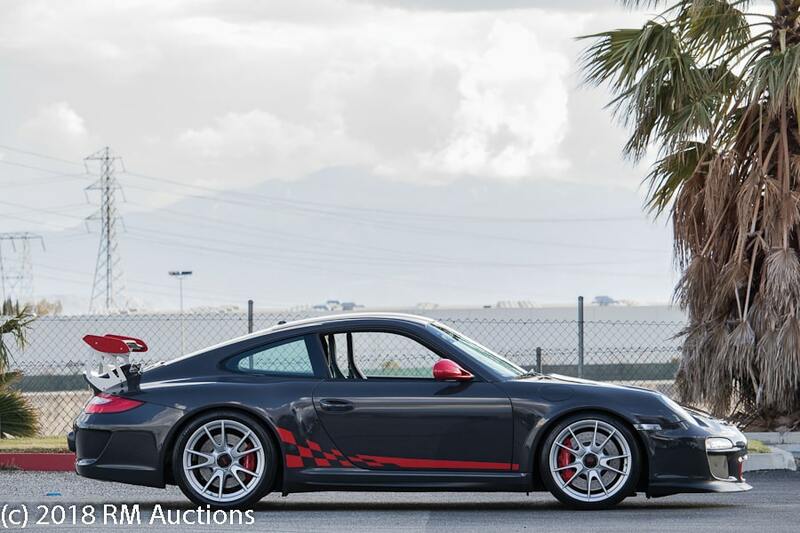 Lot # 1126 2011 Porsche 911 GT3 RS Coupe; S/N WP0AC2A9XBS783310; Dark Grey, Red graphics and mirrors/Dark Grey leather and Alcantara; Estimate $165,000 – $195,000; Unrestored original, 2 condition; With Reserve; Not sold at Hammer bid of $145,000. – Red calipers, centerlock alloy wheels, CD stereo, navigation, carbon fiber wing, bucket seats and shift knob, carbon and Alcantara brake handle. – Clean used car that will soon need rear tires. Mileage and service history not stated. – A bid of ten or fifteen thousand more probably would have seen this GT3 RS change hands, and that’s probably about what Porsche charged for the carbon and Alcantara brake handle option. 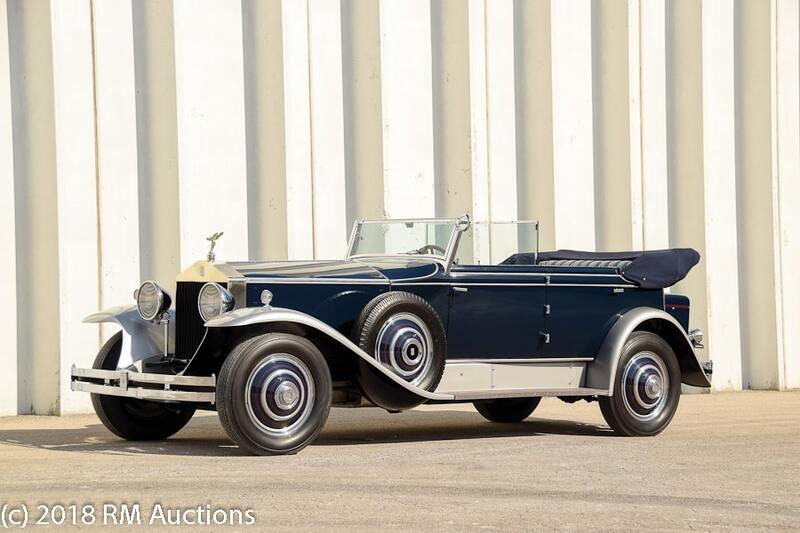 Lot # 3117.1 1930 Rolls-Royce Phantom I Convertible Sedan Newmarket; S/N S126PR; Dark Blue, Silver fenders/Dark Blue leather; Dark Blue cloth top; Estimate $200,000 – $240,000; Older restoration, 2- condition; With Reserve; Hammered Sold at $190,000 plus commission of 10.00%; Final Price $209,000. – LHD Springfield Rolls. Luggage trunk, dual sidemounts, raked windshield, body color wheel discs, rollup division, jump seats. – Strong paint and wood. Big ding on the trunk. Very good chrome and interior. Decent convertible top that is a bit tired. Tidy but used undercarriage. CCCA Senior Award recipient. A former top concours Springfield Rolls that’s no longer going to be taking top honors. It is in roughly the same condition as it was in its previous auction appearances, and still very much presentable. – Sold by RM in Houston in 2004 for $140,250 then by Bonhams at Quail in 2004 for $170,000, by Gooding at Amelia in 2010 again at $170,000 and by Bonhams at Greenwich in 2013 for $187,000. Gooding sold it at Pebble Beach in 1024 for $198,000. Barrett-Jackson had it in the Scottsdale Salon in 2015 reporting a bid of $250,000. Bonhams sold it in Scottsdale last year for $178,750. Aside from the outlandish B-J bid all the results are consistent with the amount it brought here today where the odometer shows 75,596 miles, 525 more than it did back at Quail in 2004 and hardly enough to keep it lubricated over the past fourteen years. 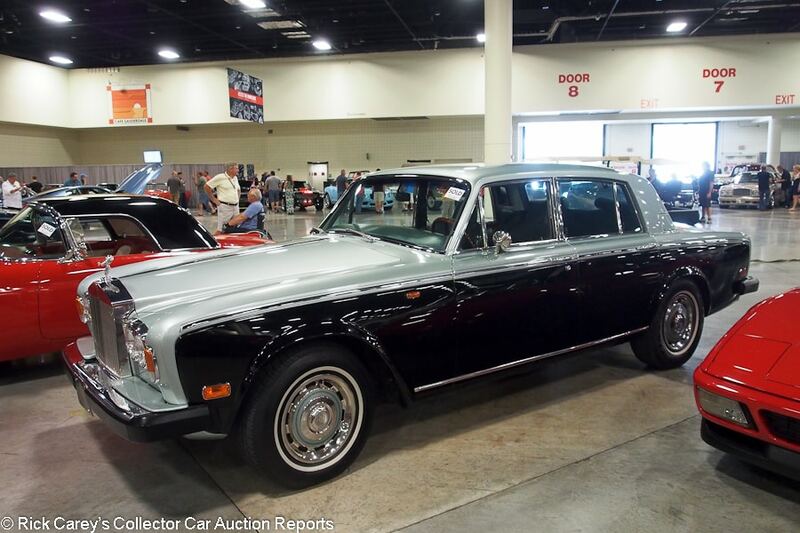 Lot # 1079 1976 Rolls-Royce Silver Shadow 4-Dr. Sedan; S/N SRE25981; Light Metallic Green, Dark Green sides/Moss Green leather; Estimate $25,000 – $30,000; Visually maintained, largely original, 3 condition; With Reserve; Hammered Sold at $18,500 plus commission of 10.00%; Final Price $20,350. – Air conditioning, Blaupunkt AM-FM, indash 8-track, black spoke Nardi woodrim steering wheel, wheel covers, narrow whitewalls, power windows. – Sound older repaint with one 3/4 inch crank on the hood. Rust blister by the left mirror. Two edge chips on the left hood side. Peeling old undercoat in the wheelwells. Sound but scuffed chrome. Very good lightly stretched upholstery, interior trim and wood. Very clean unrestored engine compartment doesn’t look like it has ever been apart. A handsome driver. – This is a handsome price, even for this handsome driver. It shows 9,710 miles on the odometer, highly likely having rolled over once or they would have been shouting the mileage from the rooftops, which they weren’t. 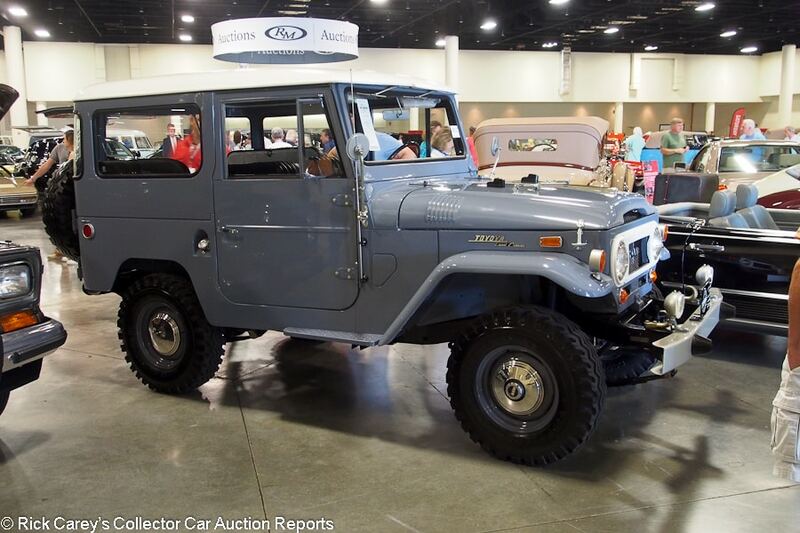 Lot # 1155 1968 Toyota FJ40 Land Cruiser Hardtop; S/N FJ4057338; Grey, White roof/Black leather; Estimate $50,000 – $60,000; Recent restoration, 2 condition; With Reserve; Not sold at Hammer bid of $47,500. – AVM locking front hubs, AM radio, aftermarket air conditioning, center facing rear seats, electric power steering, F146 six-cylinder, 3-speed. – Very good clearcoat repaint, interior, chassis and engine. Restored like new without going overboard. The metric instruments suggest it’s a recent import and rebuild. – This is one of the more sympathetically restored Land Cruisers seen in a while but declining a bid 5 or 10% below the low estimate is not realistic in a market with decent Land Cruisers pretty much everywhere. I’ve just recently “found” you again and am earnestly reading your reports. My question is about lot #1063, the 1936 Packard Super Eight. Why does someone spend $76,000 on a car that they honestly don’t need for transportation. Then sell six months later and lose almost $20,000. It was bought presumably for fun and maybe a profit. I can understand holding on for a year. This car wasn’t the only example of a quick flip. Are there that many fools out there? I apologize for the delay in responding to your comment. 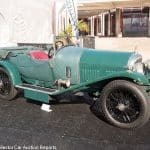 I was in Monaco for the RM, Bonhams and Coys auctions and returned only last evening. Your observation is cogent, but the Packard situation is not unusual. There are many possible reasons. 5- The seller (assuming this seller is the Hershey buyer) bought the car for a specific event and having utilized it for the event (wedding, anniversary, show, tour, …) chalked the $20K up to the experience. That hardly exhausts the possibilities, but illustrates the range of situations that might result in this series of transactions. 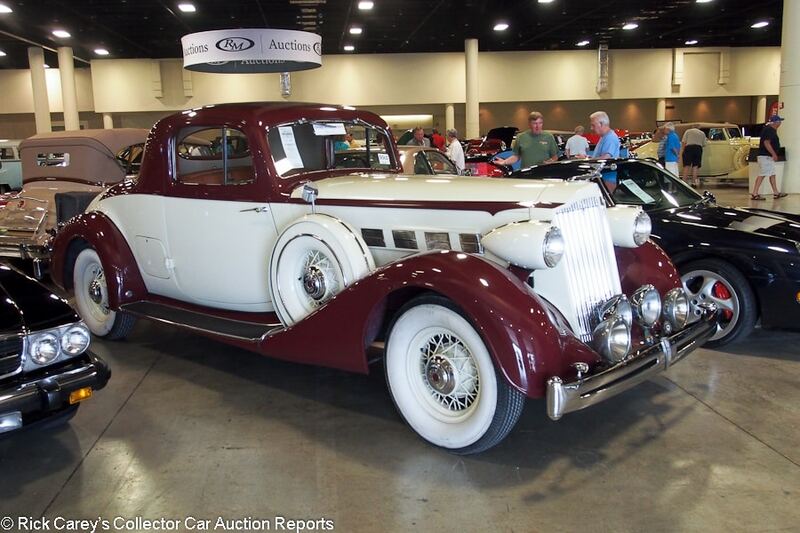 In none of these situations is there a ‘fool’ involved, just a miscalculation that in Ft. Lauderdale resulted in the buyer getting a good closed ’36 Packard for an advantageous price. Collecting cars is not — nor should it be — about making a profit. Nor is it necessarily rational. In fact, it should be emotional and that sometimes leads to results like this. Thanks for your insight. I, too, am a member of the hobby. I just tend towards buy and hold.